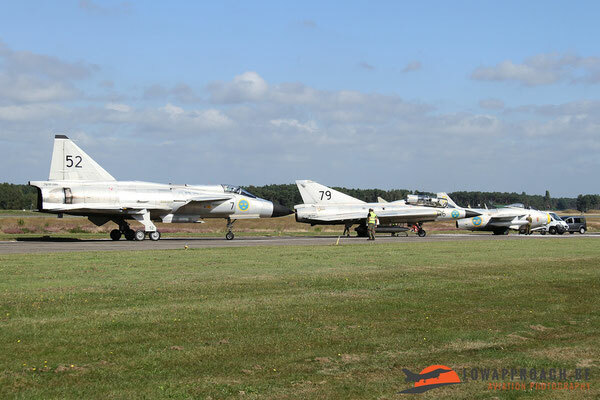 ‘Burenkijkdag’ Kleine Brogel – September 9th, 2016. A few weeks ago Kleine Brogel airbase opened its doors for the neighbors. Purpose of this event was to give a behind the doors look to the inhabitants of the villages that surround the airbase. For many the role and tasks of the military remained a bit of a mystery and with this event the people were given the opportunity to fill this gap. 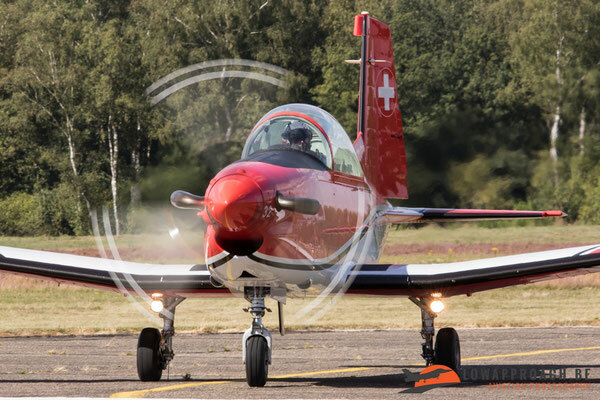 By explaining the role and tasks, and expecially the amount of training involved to perform this role in a safe manner, the airbase hopes to create some understanding with their neighbors who in cases complain with regards to the noise levels from the aircraft. September 9th was not chosen at random as this was also the day that there was some extra flying linked to the Sanicole Airshow the next weekend. 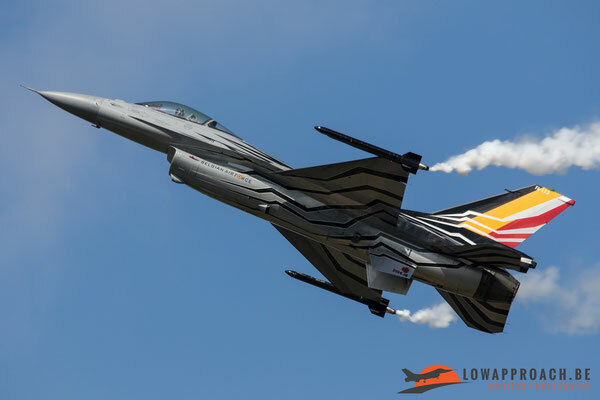 Sanicole Airshow is supported by Kleine Brogel, as it acts as the base from which the larger aircraft can take-off and land during the weekend. 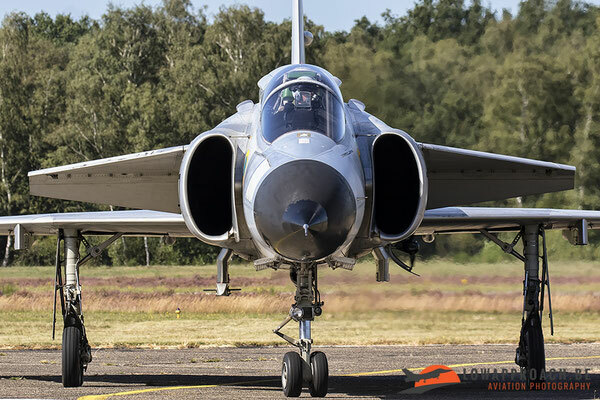 Many local spotters used this occasion to witness the Sanicole arrivals from a different perspective, away from the more traditional landing shots, an opportunity that also our team used for this report. 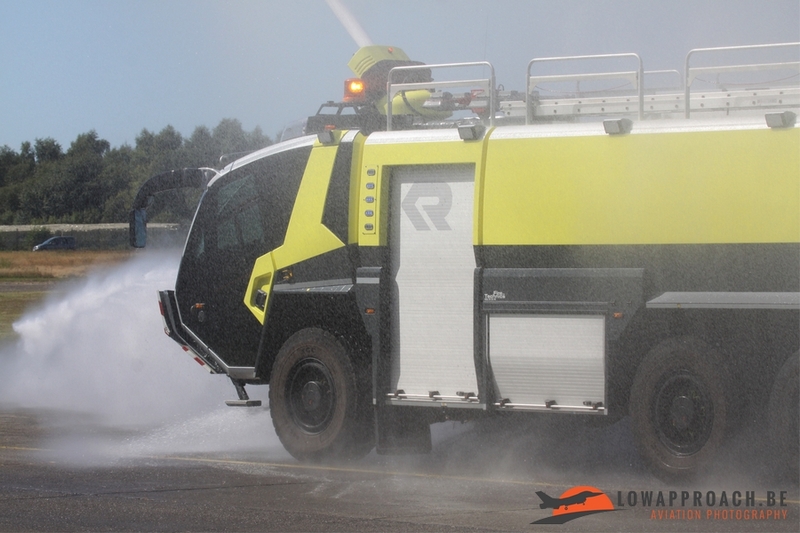 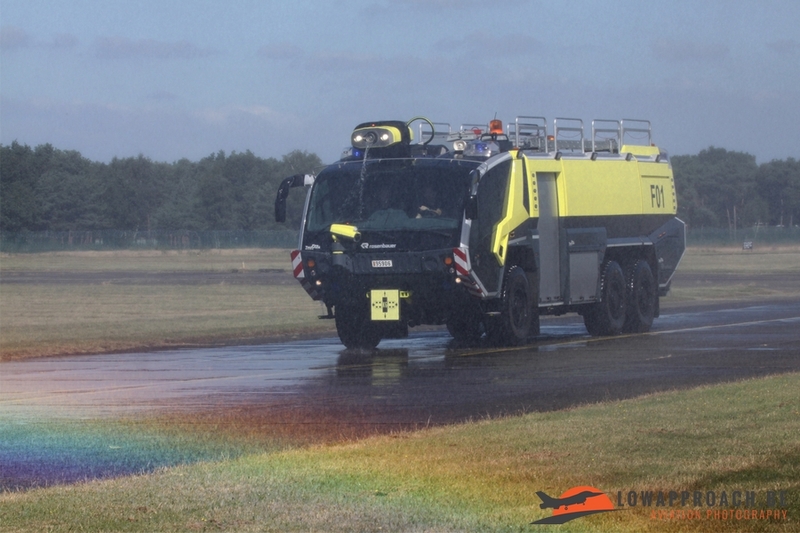 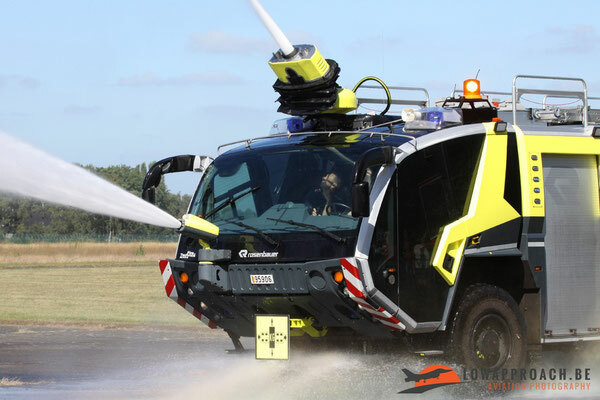 demonstrations from the non-flying departments came from the 10 W Tac Fire Department who demonstrated the capabilities of their new Rosenbauer Panther fire truck. 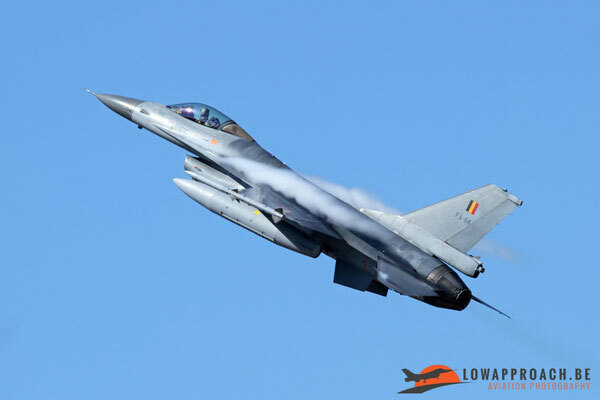 Off course most attention went to the local F16s who during their take-off and landings treated the audience to some spectacular manoeuvres. 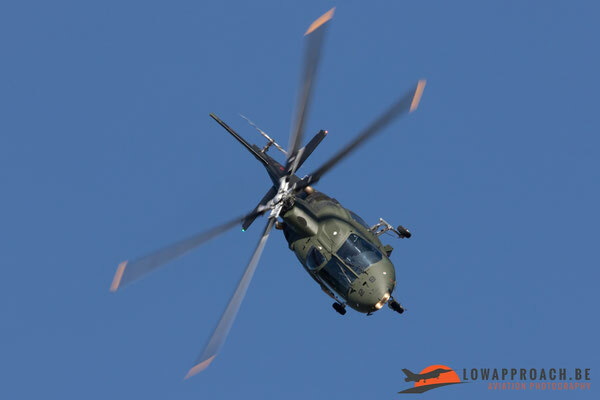 As weather conditions were virtually perfect the whole day this has resulted in some nice action shots. 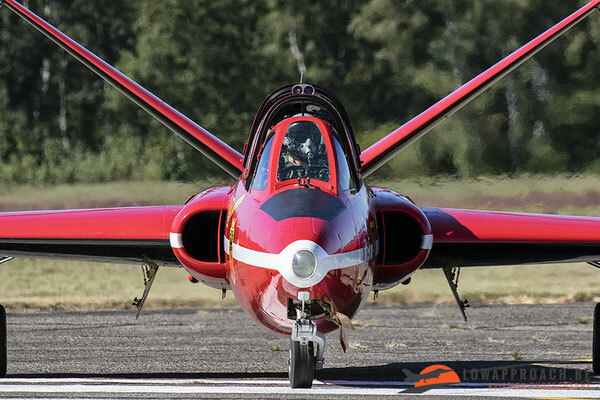 This was only the starter. 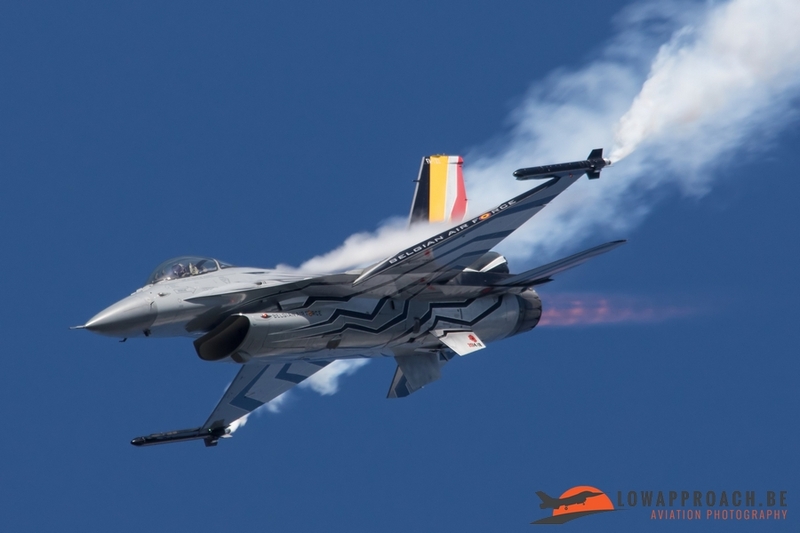 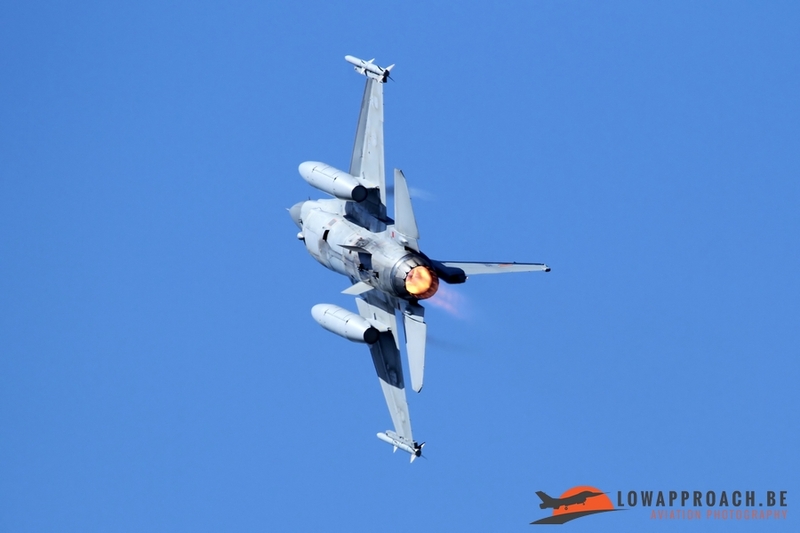 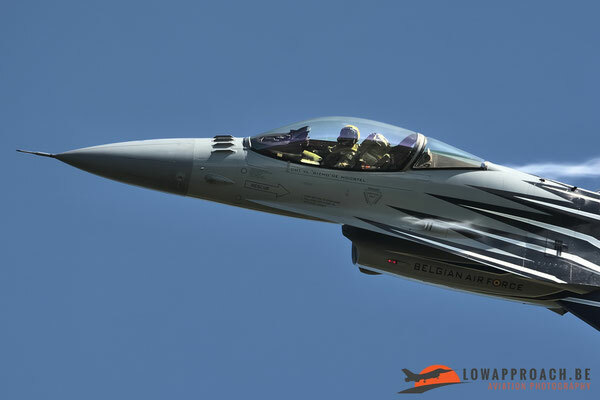 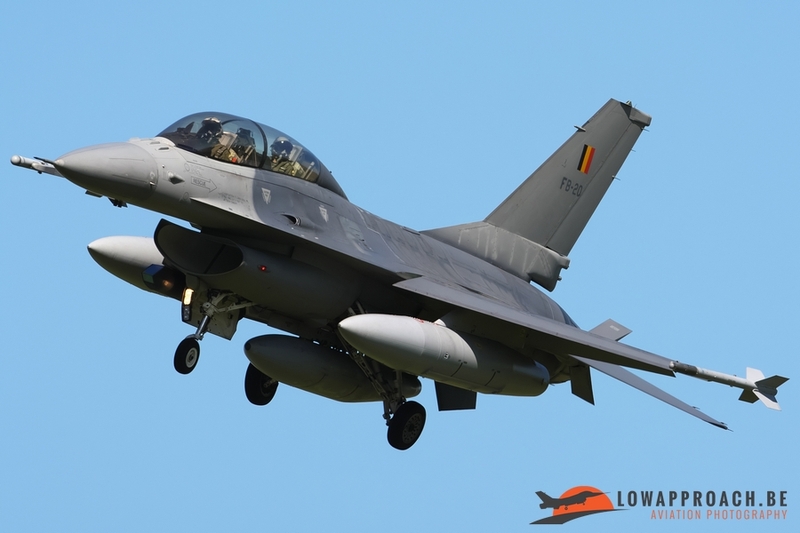 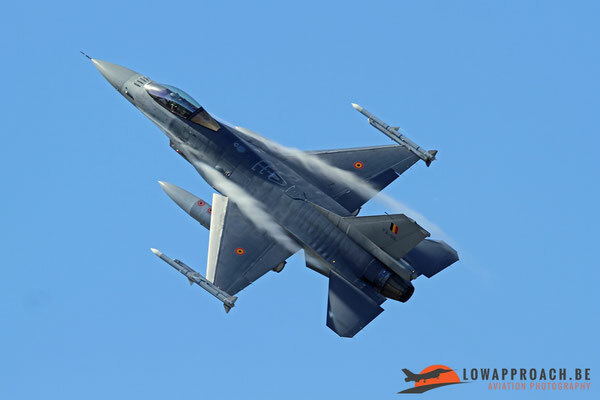 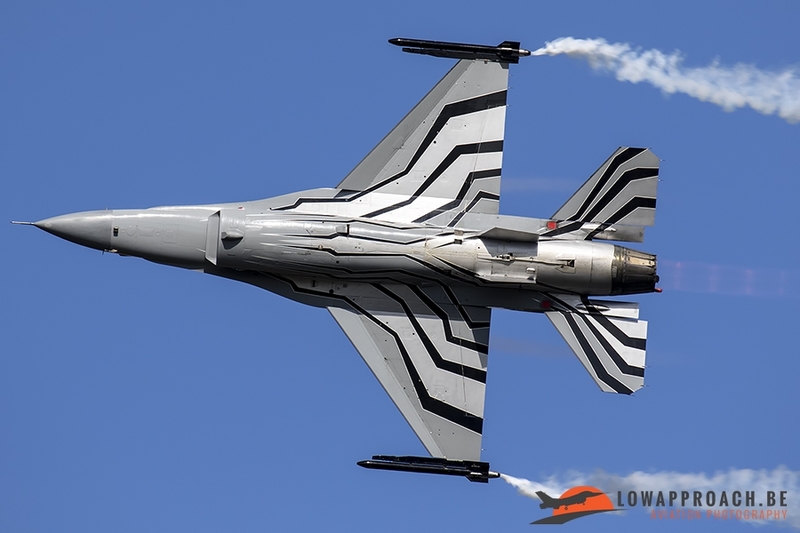 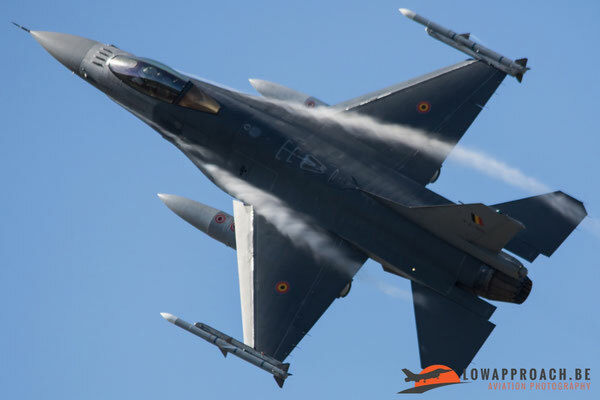 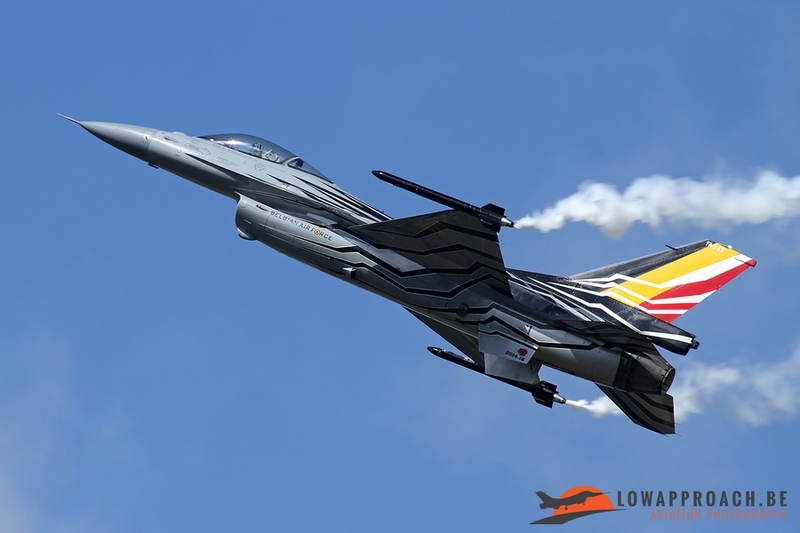 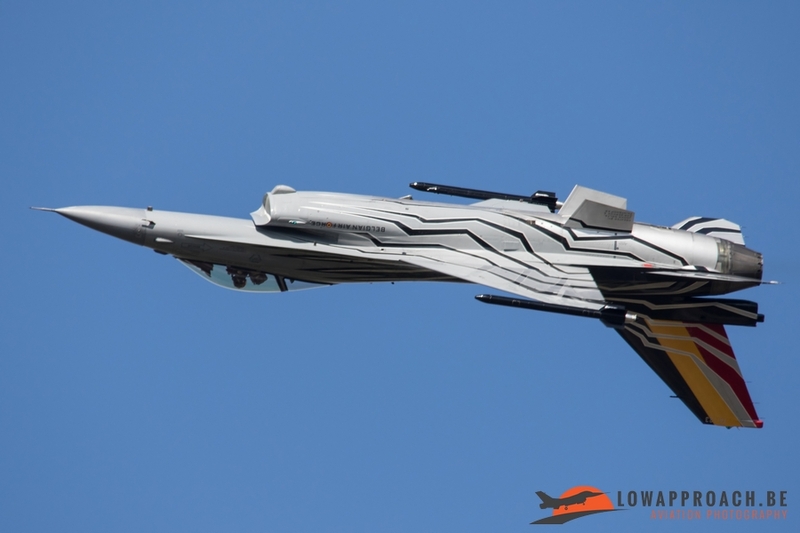 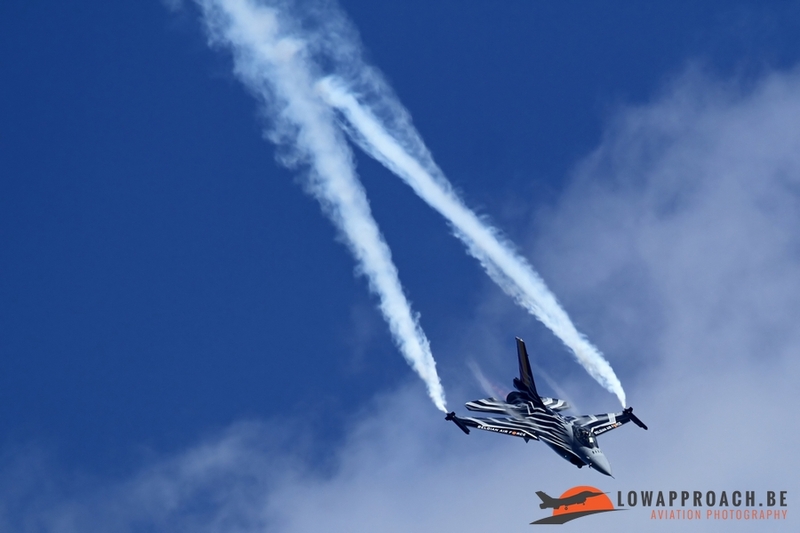 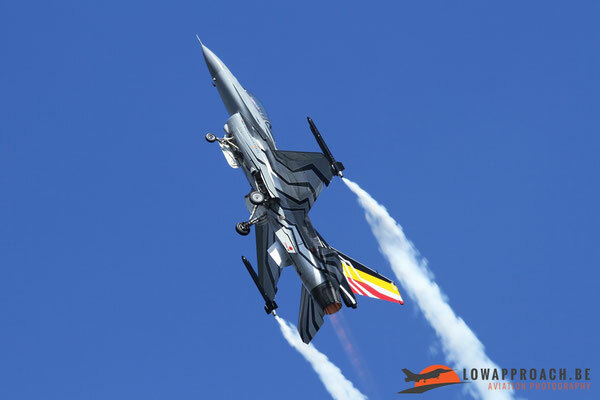 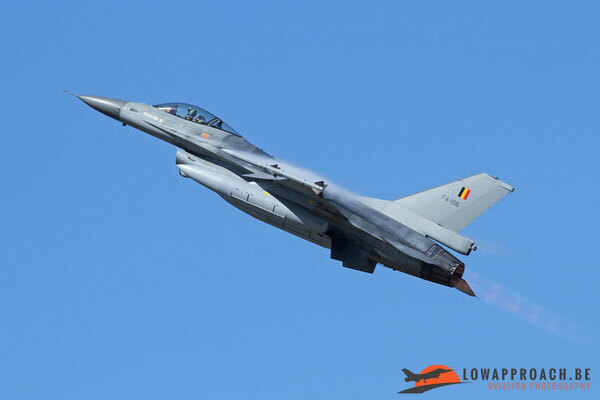 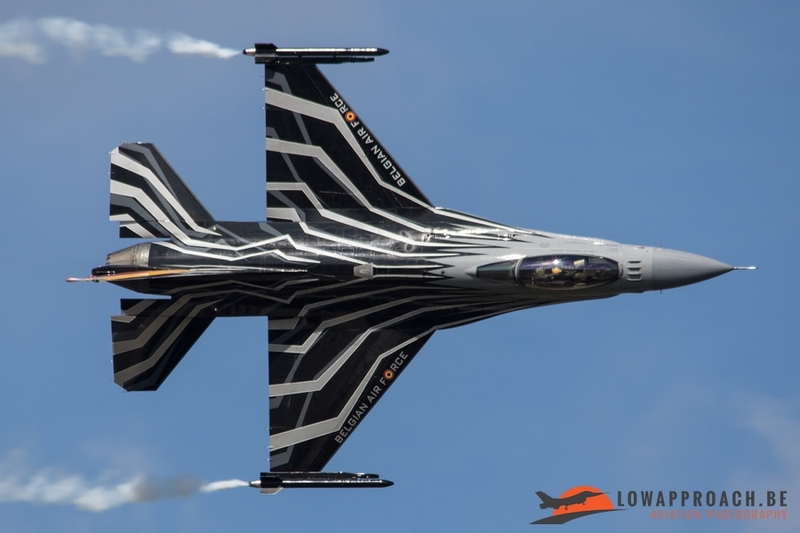 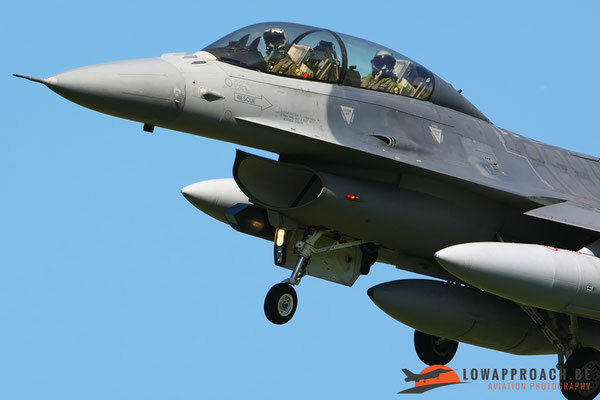 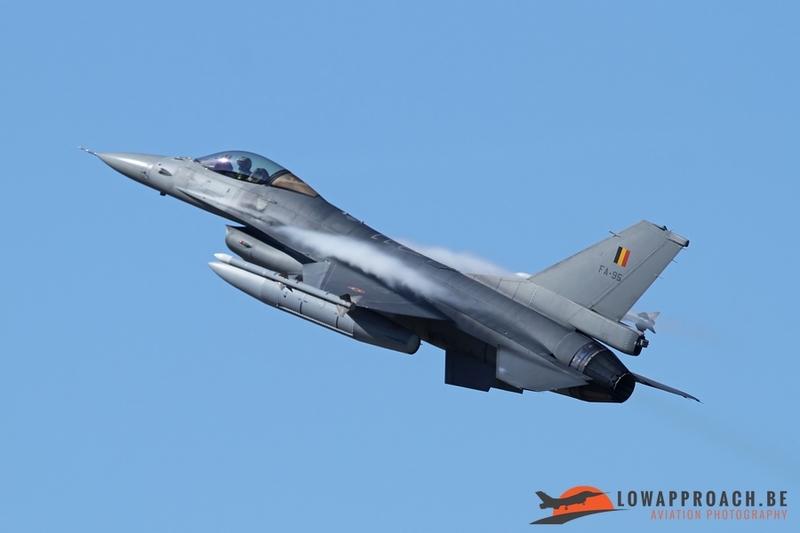 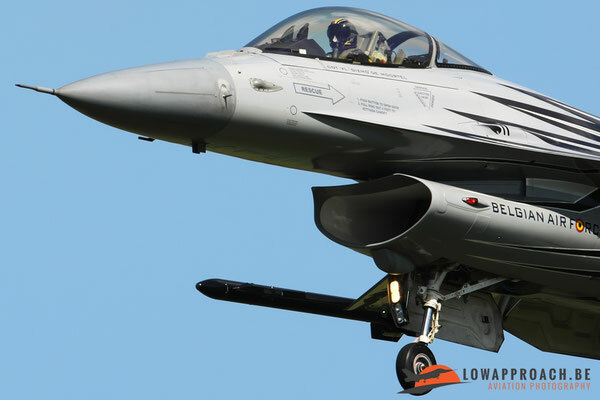 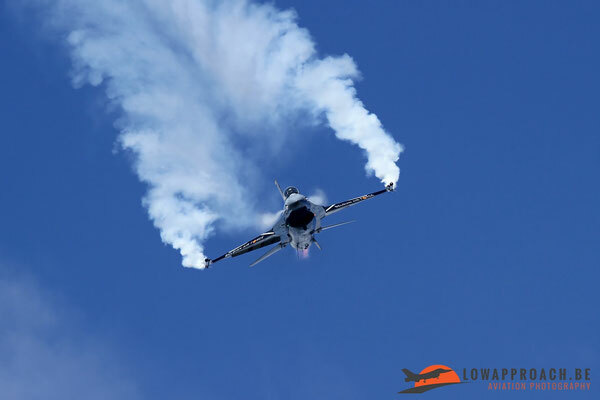 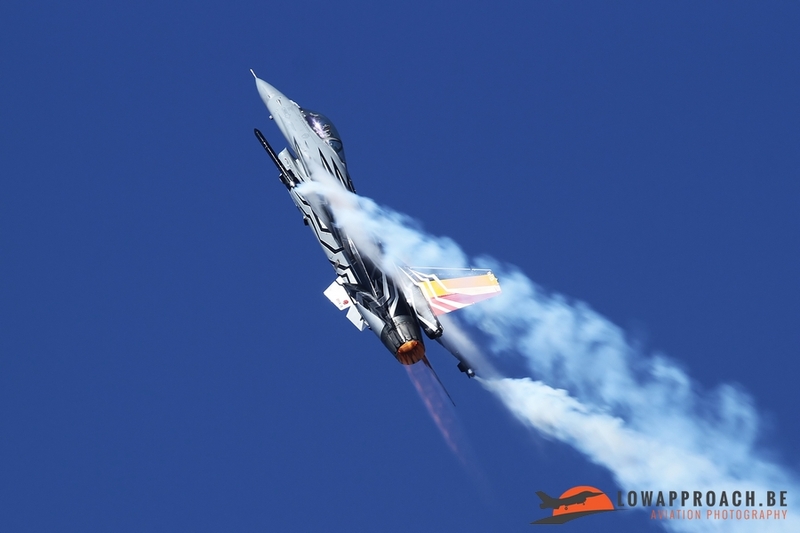 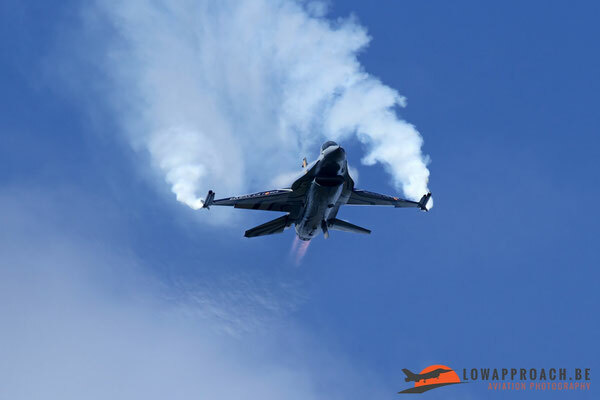 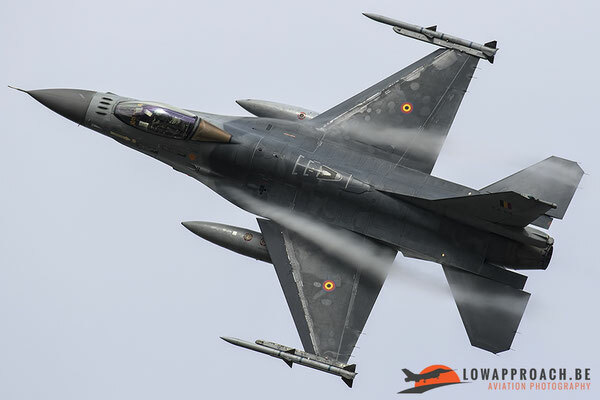 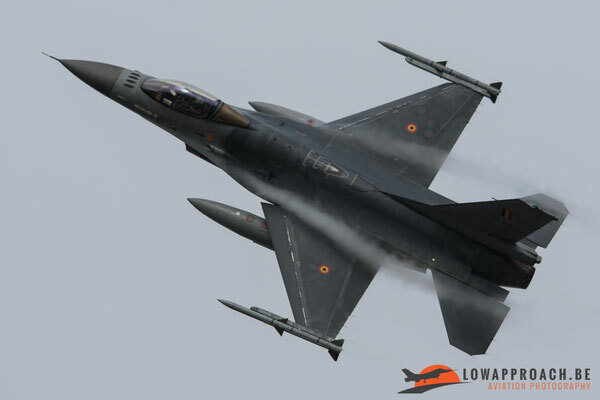 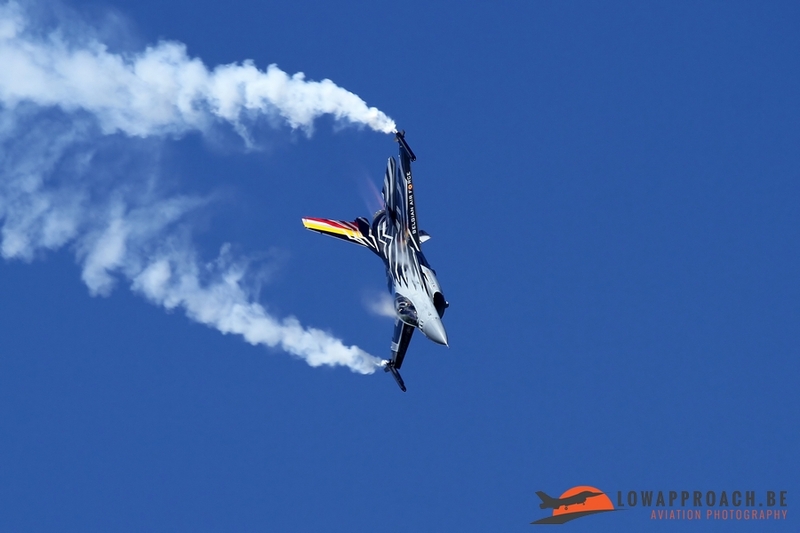 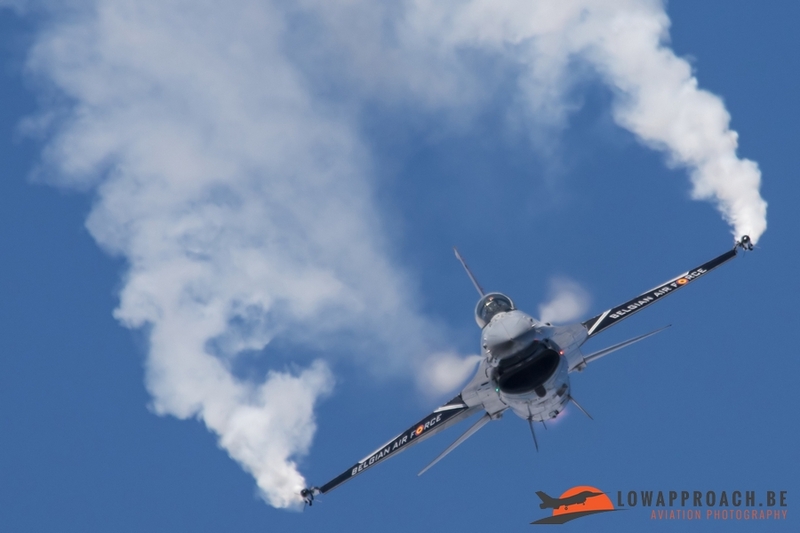 10 W Tac acts since last year as the host unit for the official Belgian Air Force F16 demoteam. 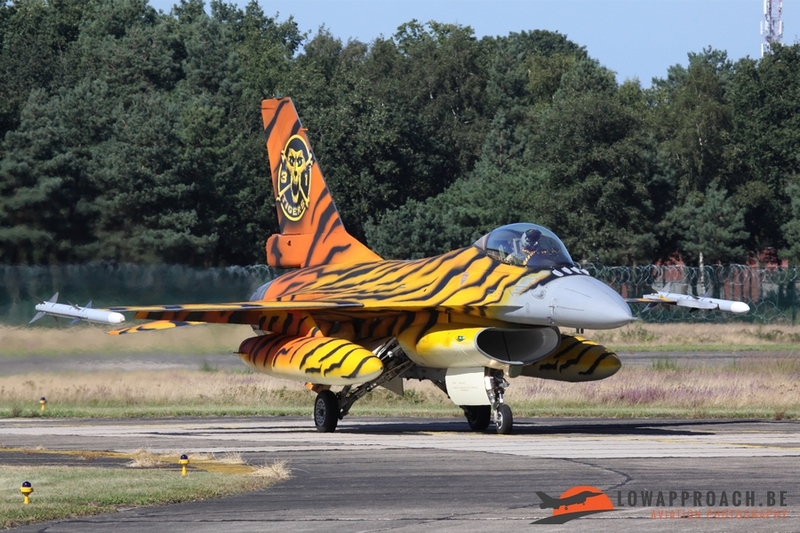 Cdt.vl.Tom ‘Gizmo’ De Moortel gave a splendid demonstration with his specially painted F16, nicknamed ‘Blizzard’. 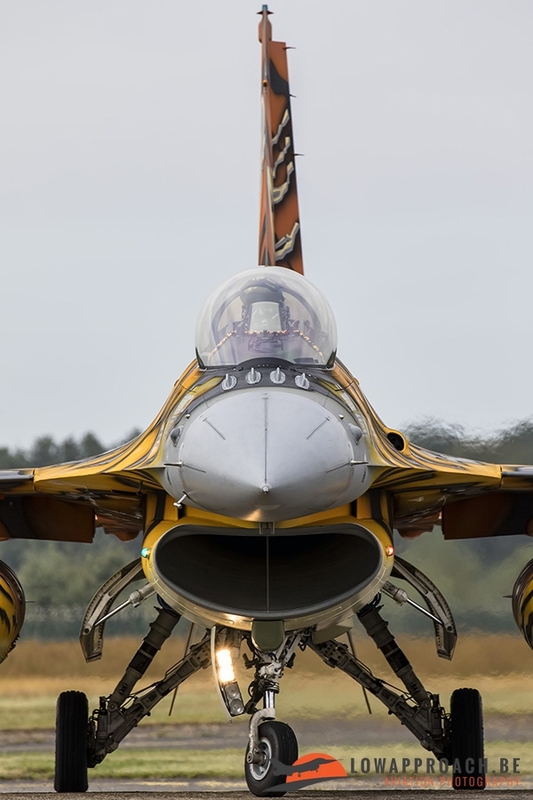 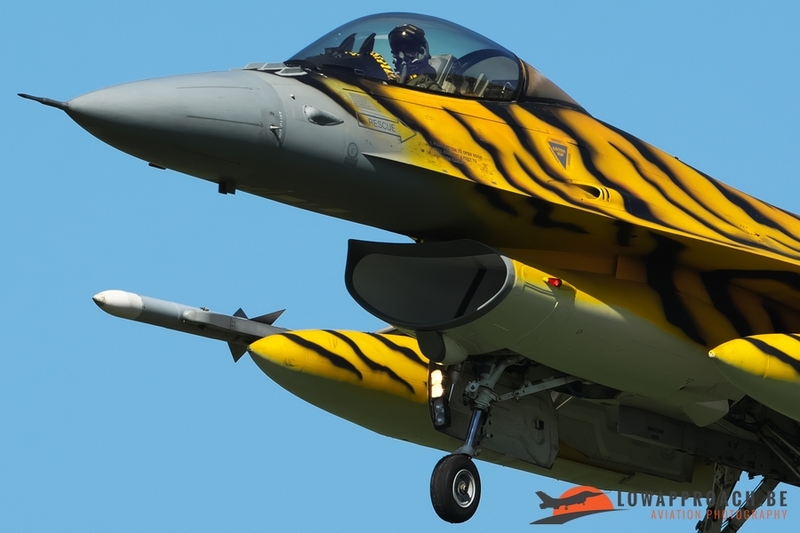 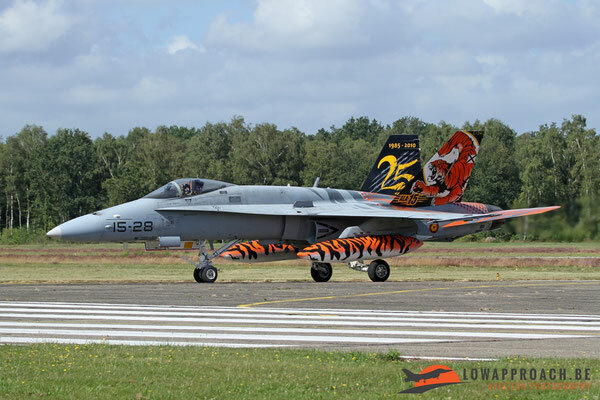 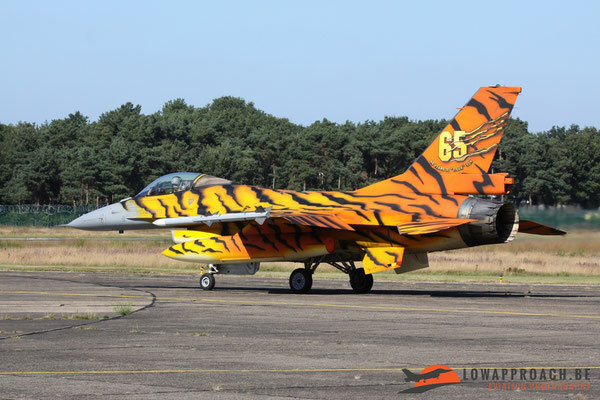 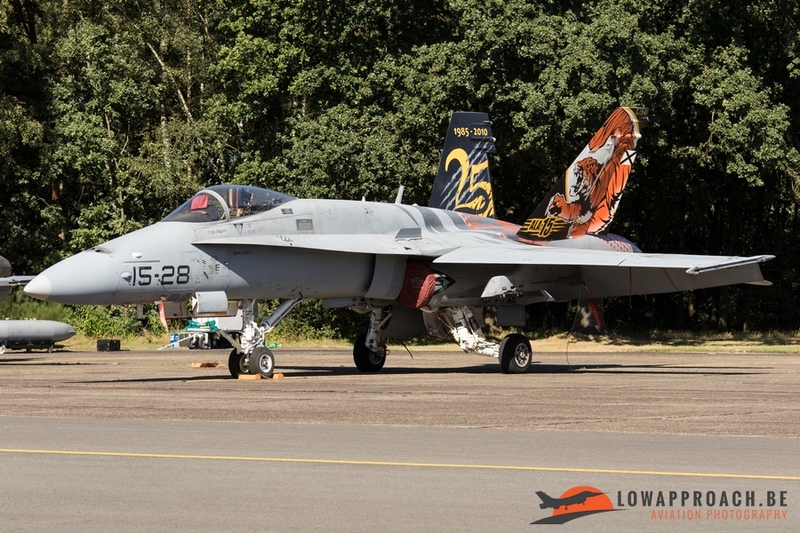 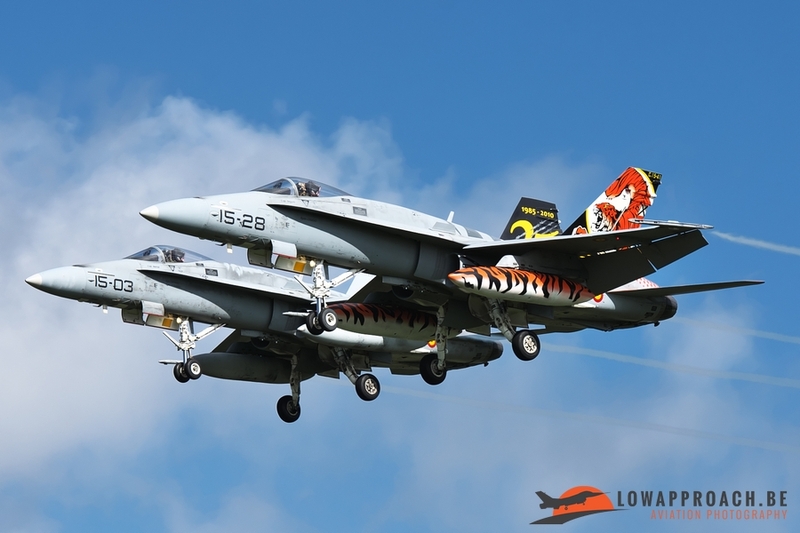 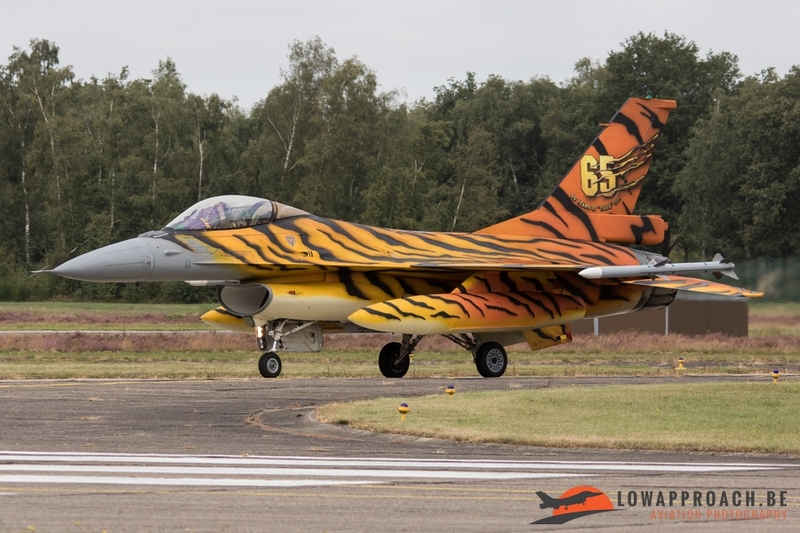 The aircraft with the most flamboyant color scheme at Kleine Brogel is this years ’31 Squadron ‘Tiger’. 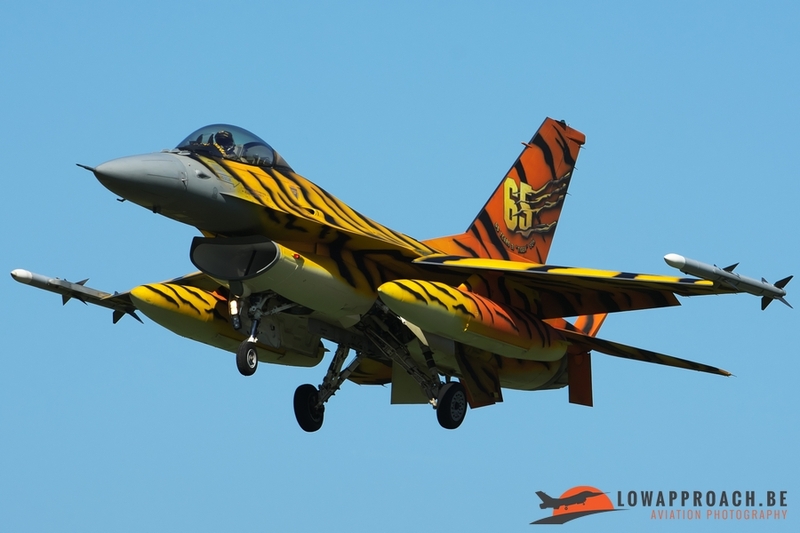 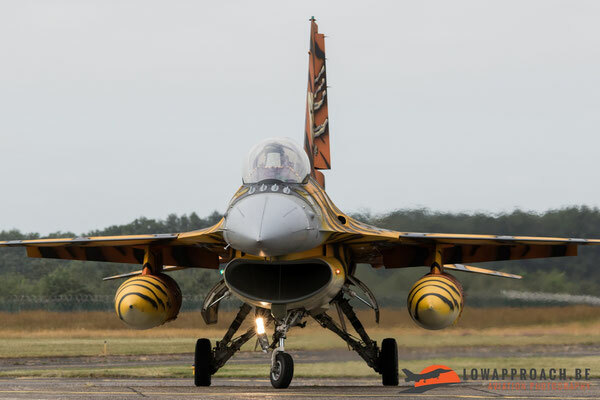 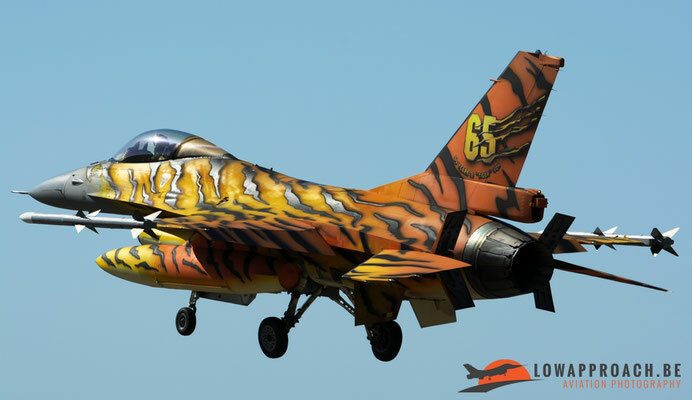 This F16 was painted in Tiger colors in preparation of the 2016 NATO Tiger Meet, held at Zaragoza in Spain. All the effort was really worthwhile as the squadron won the ‘Silver Tiger’ for the 9th time in the existence of Tiger Meet, which was first held in 1961. During the afternoon the other Belgian Air Force demoteams displayed as well, starting with the Agusta A109 team, based at Beauvechain. 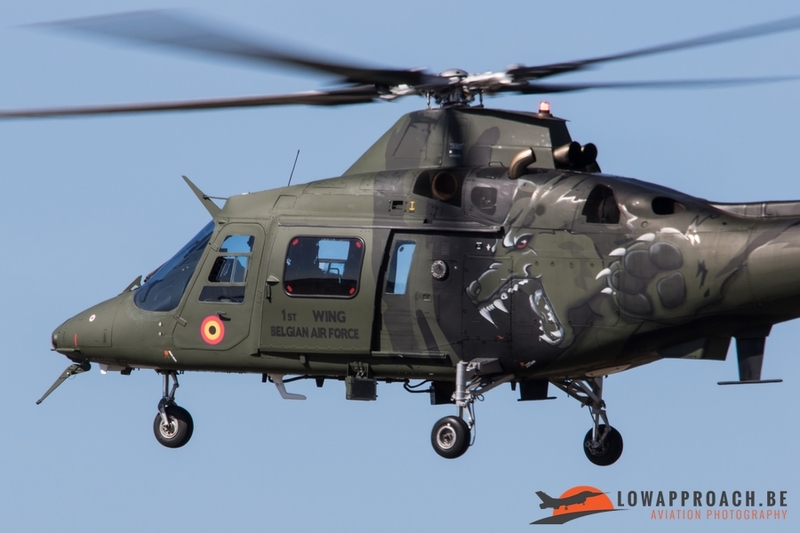 This year they use a newly painted helicopter depicting a wolfshead, the official crest of 1 Wing. 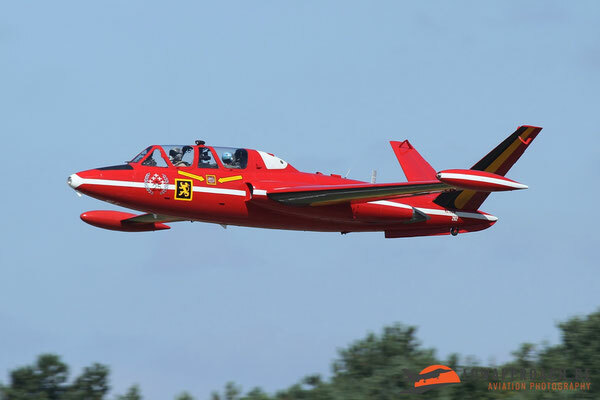 Last display came from the ‘Red Devils’ demonstration team also based at Beauvechain. 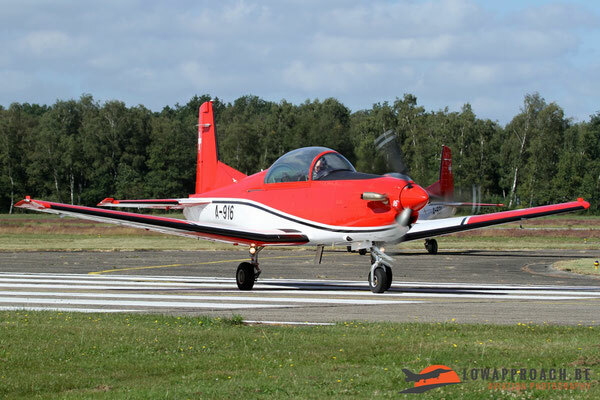 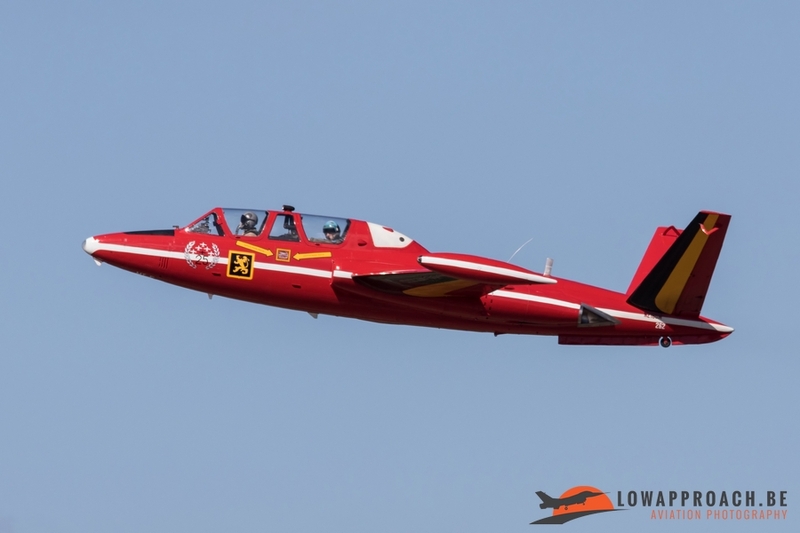 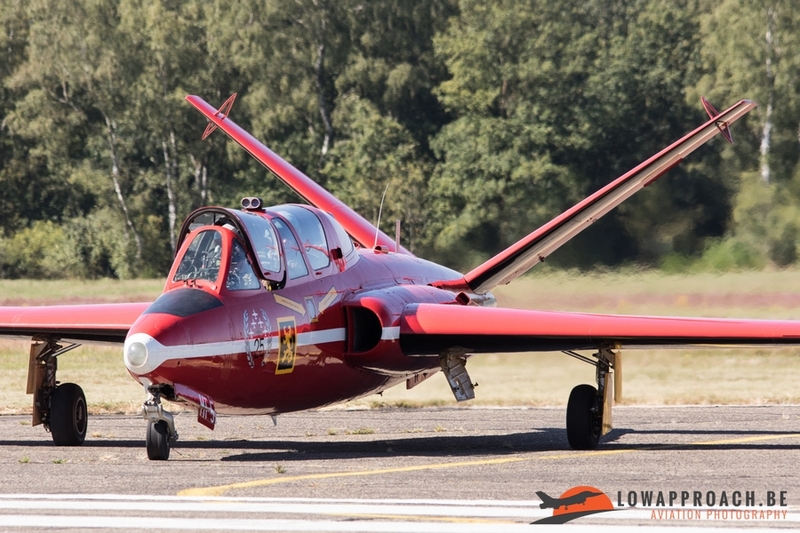 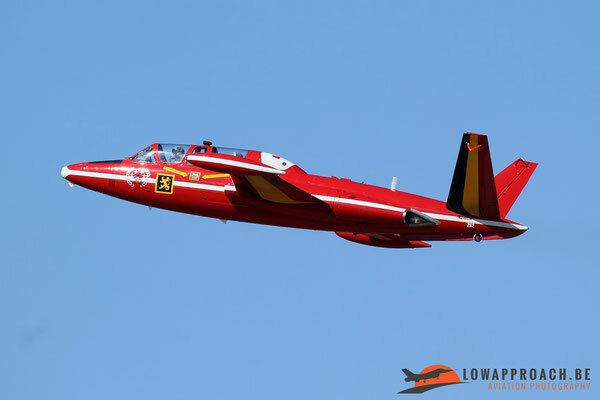 This team, who inherited the traditions from the Red Devils jet team from the 1950s; 60s and 70s, currently uses the Siai-Marchetti SF260M, normally used for basic flight training. 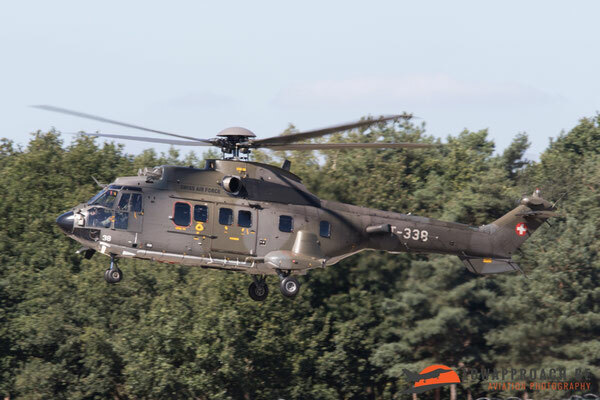 The remaining flying activity for the day were the arrivals and training flights for Sanicole. 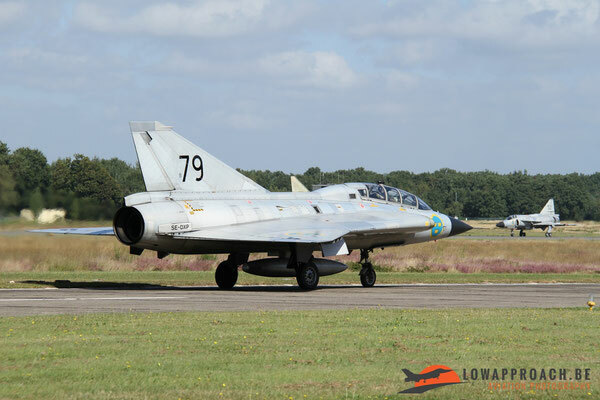 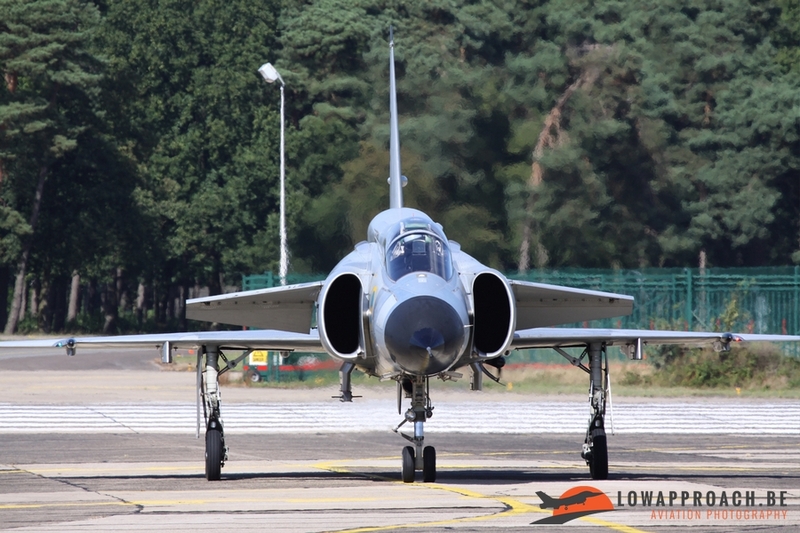 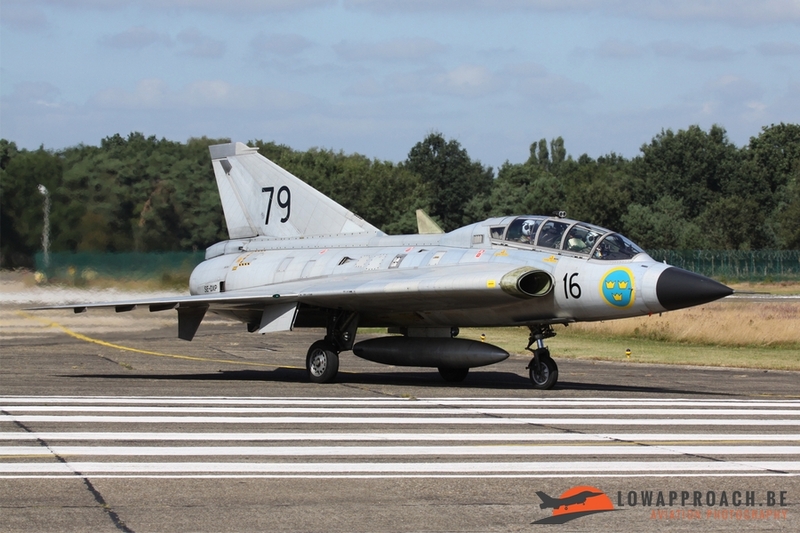 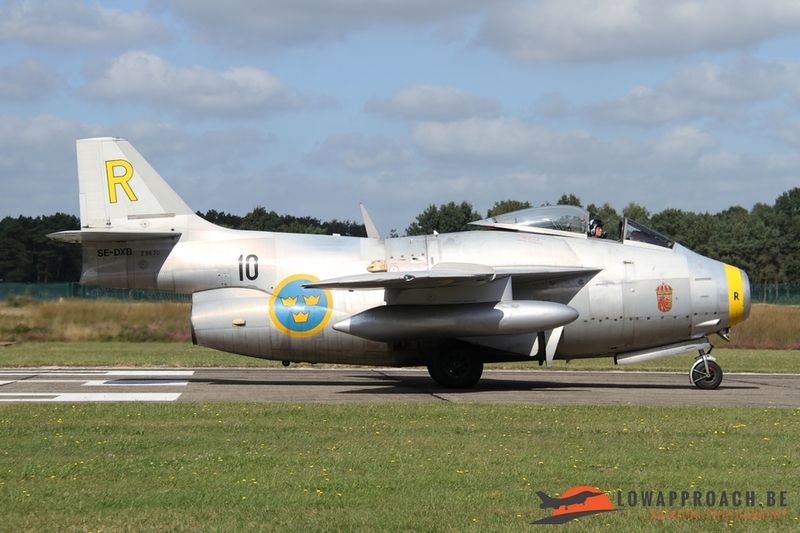 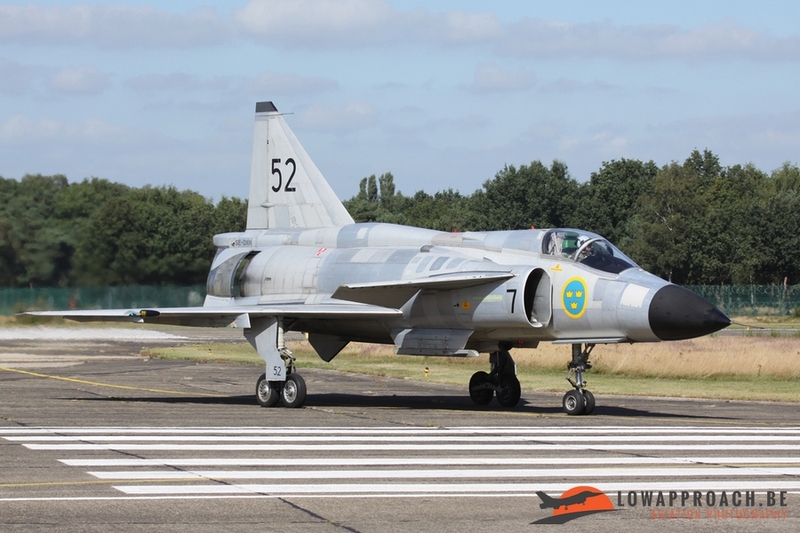 One of the nicest arrivals was virtually the complete collection from the Swedish Air Force Historic Flight. 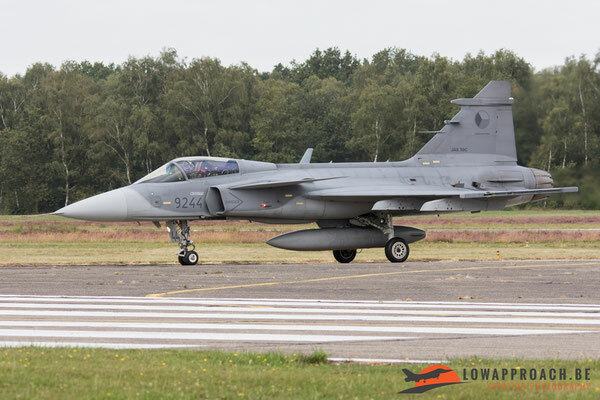 This organization, based at Linköping, send four jet aircraft to Kleine Brogel. Oldest aircraft of the pack was the Saab J29F Tunnan, the flying barrel. 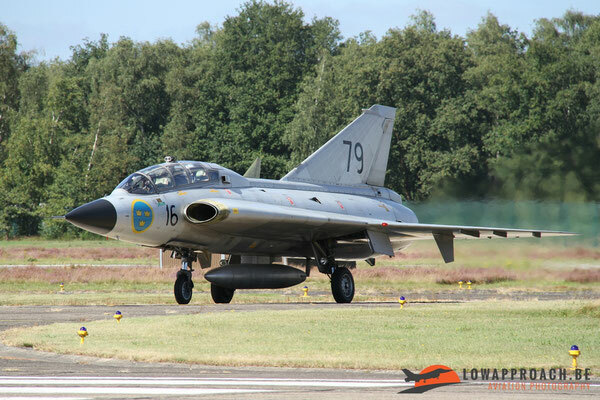 In Swedish service the Tunnan, was replaced by the more advanced Saab Sk35 Draken, the second type that arrived at KeeBee. 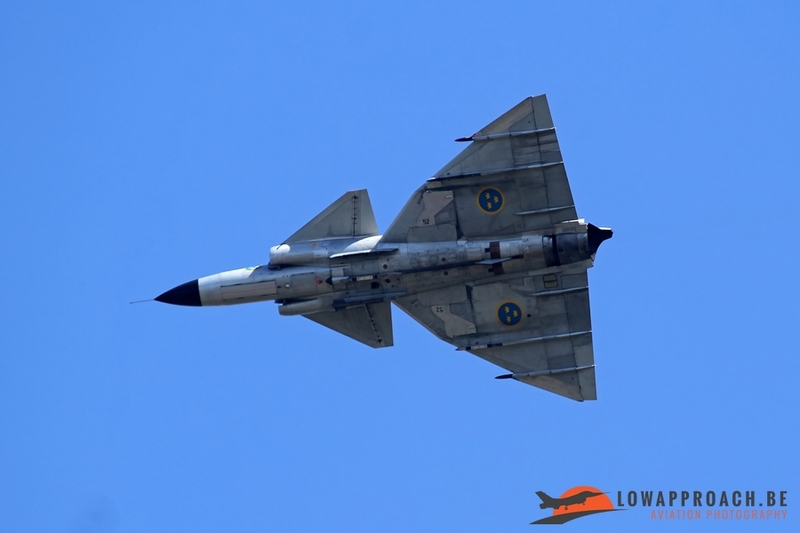 The final former frontline jet that the Swedish send, was the magnificent Saab AJS37 Viggen. This aircraft with the very characteristic Double Delta-wing is the only one in airworthy condition, so a real rarity to see. 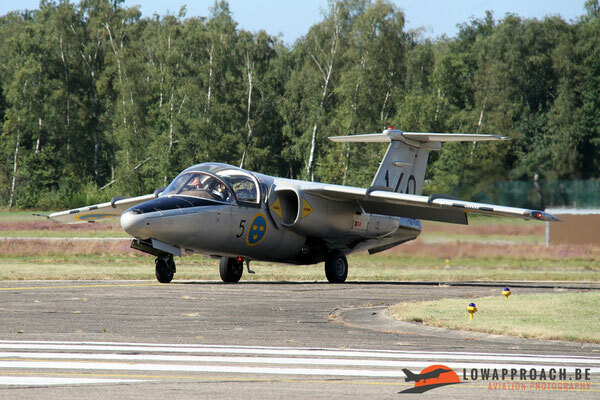 Final aircraft to make the trip from Sweden was the Saab Sk60 (Saab 105) jet trainer. 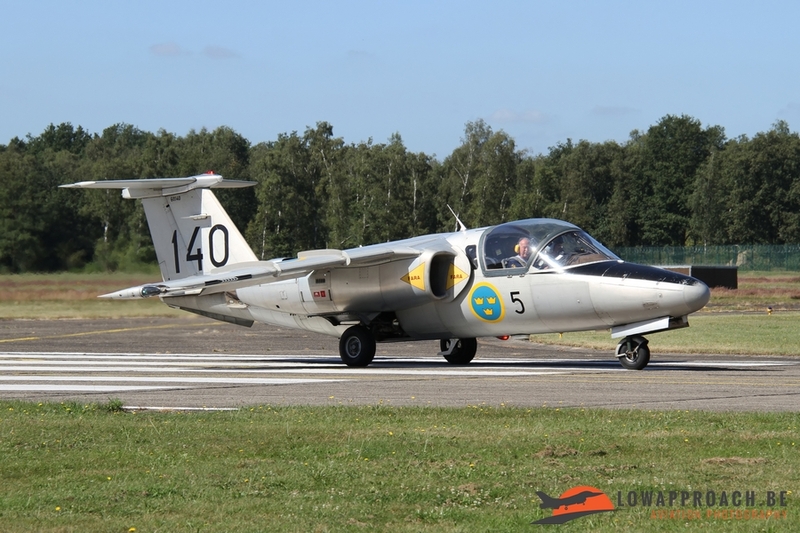 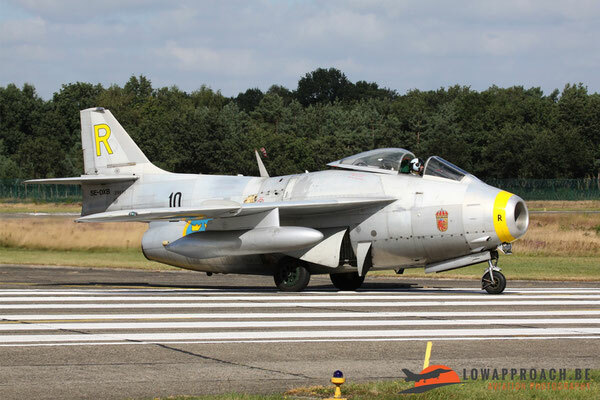 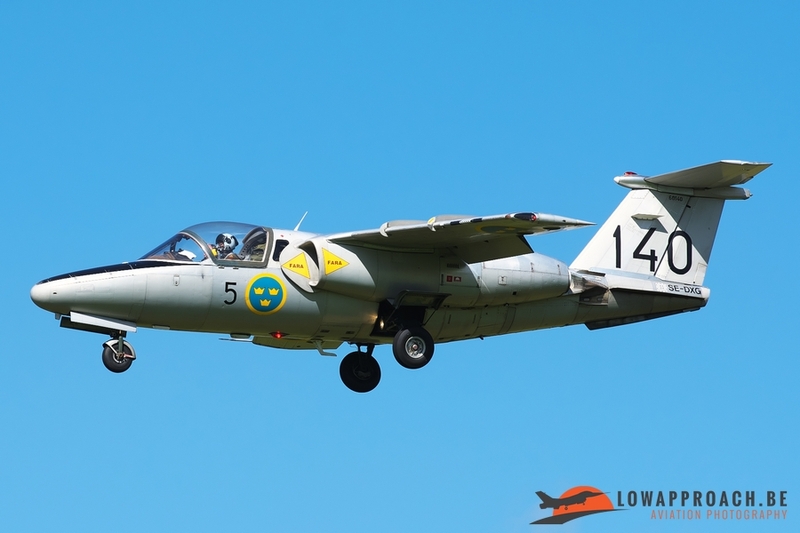 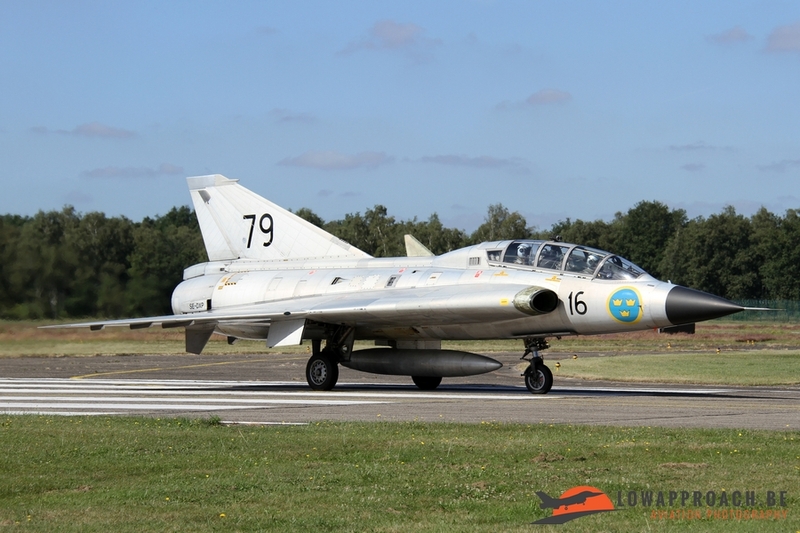 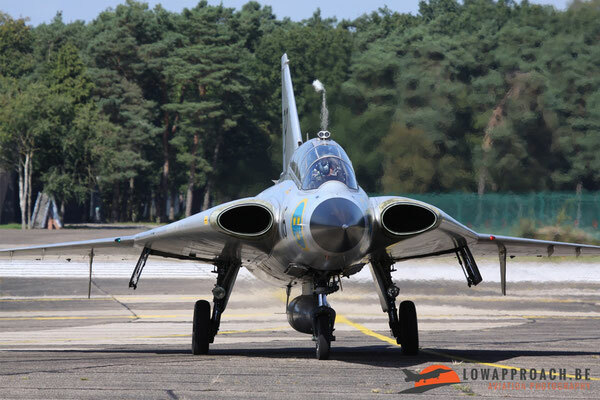 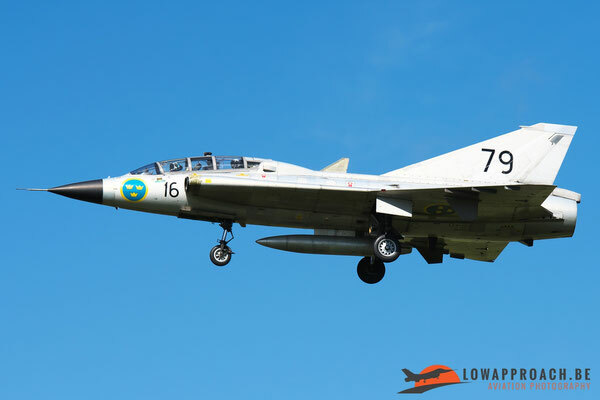 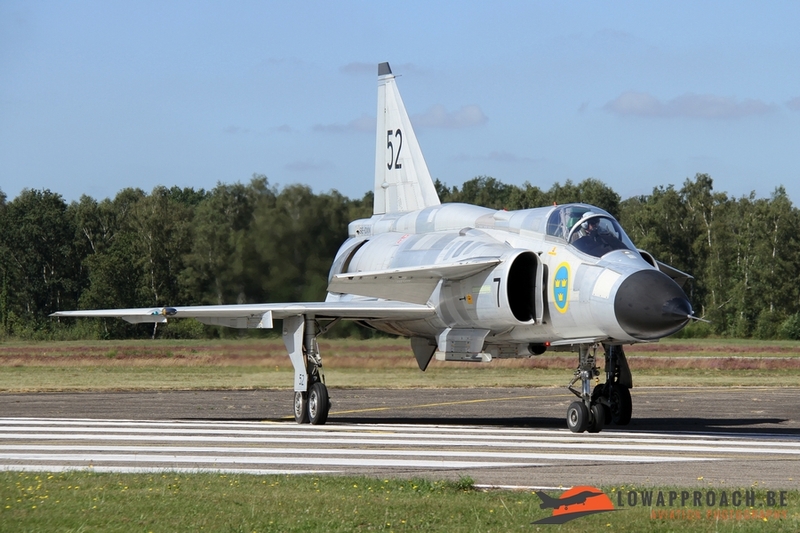 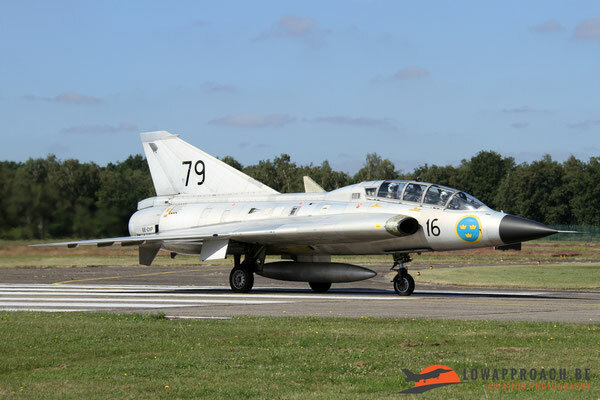 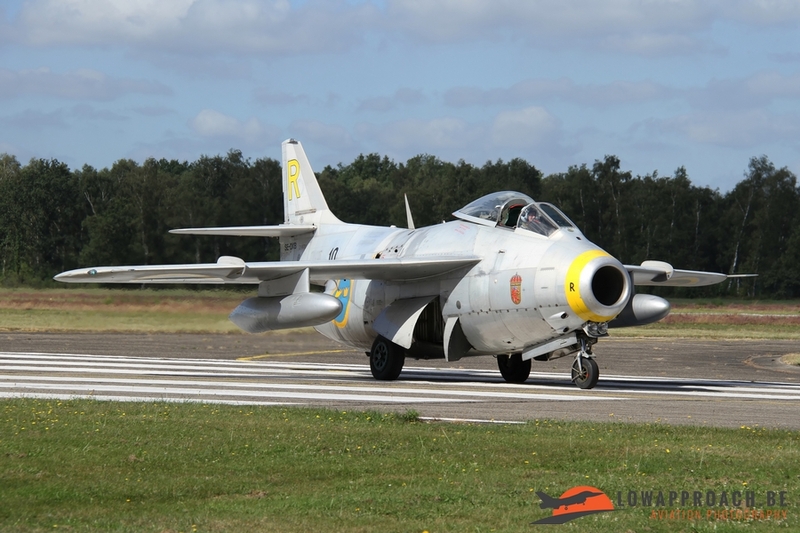 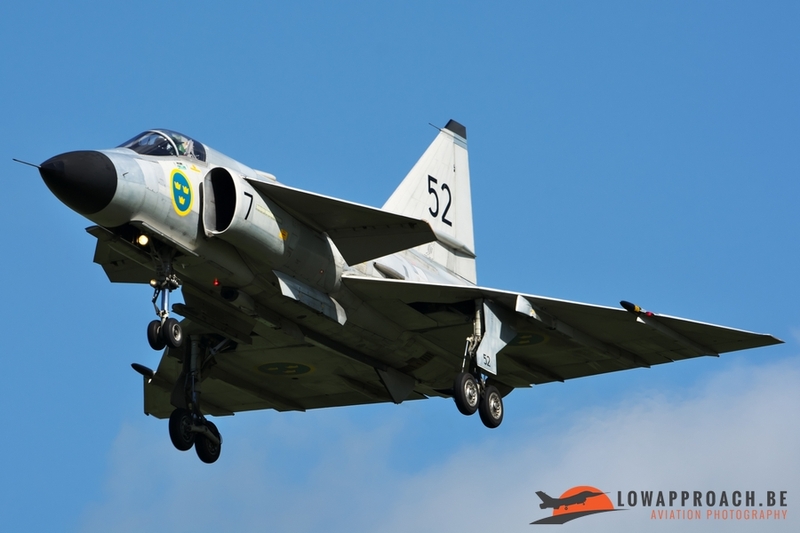 This aircraft is still in active service with the Swedish Air Force, but also the Historic Flight operates an example. 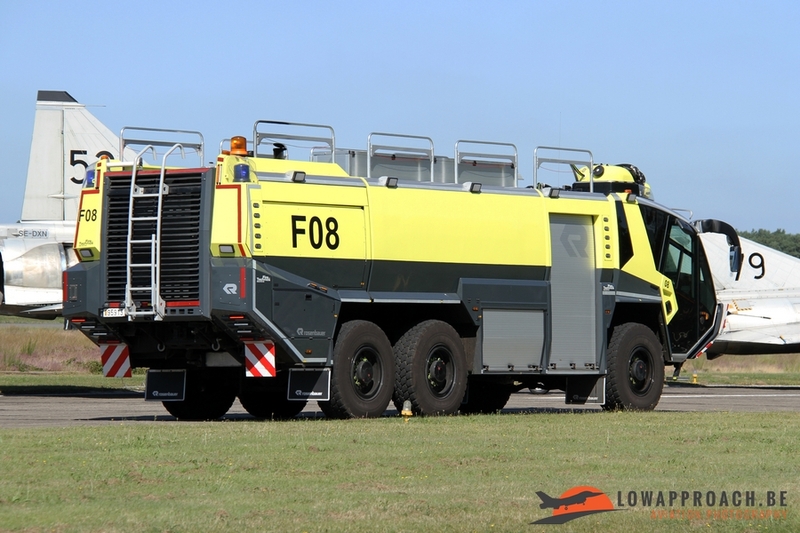 The aircraft has a double use, as it not only participates in the flying displays but is also used as the transport of the technician. 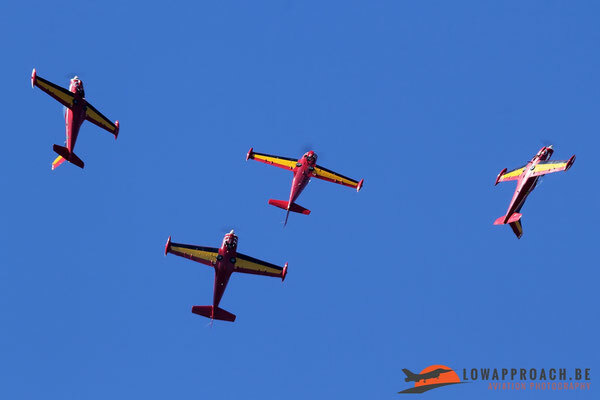 This quartet really formed a very nice line-up in front of the audience. This was the final Saab from the SwHF that we saw at Kleine Brogel. 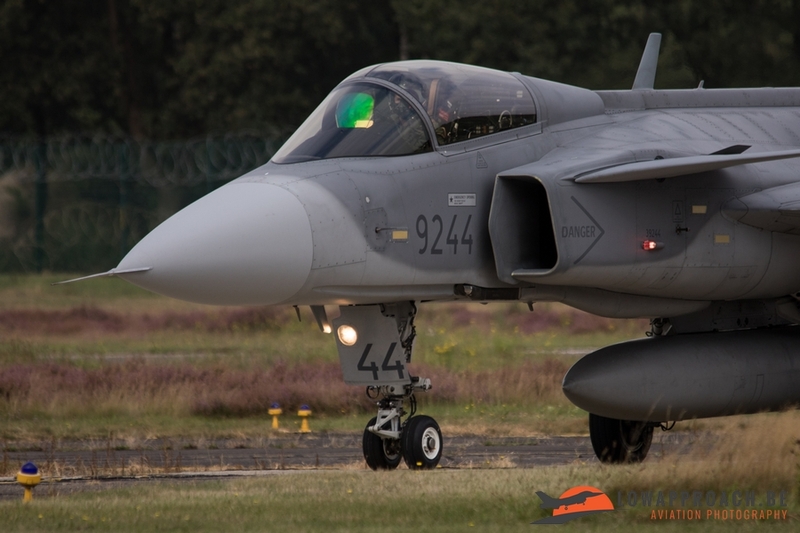 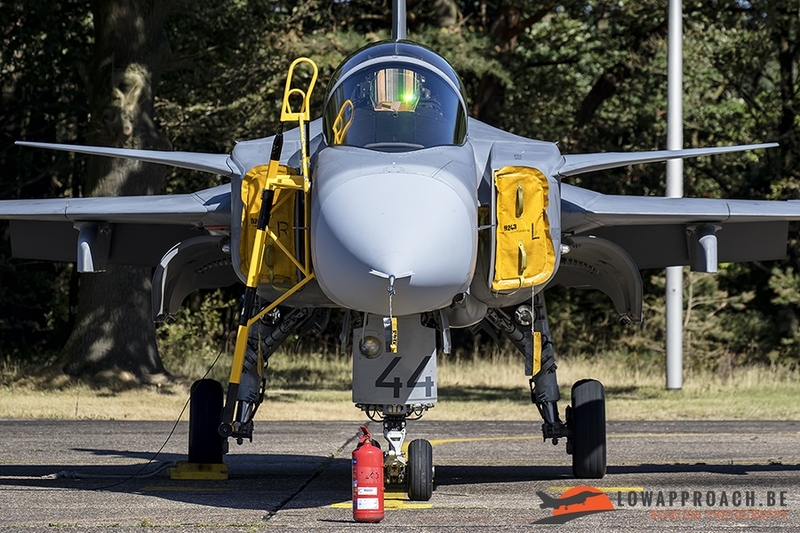 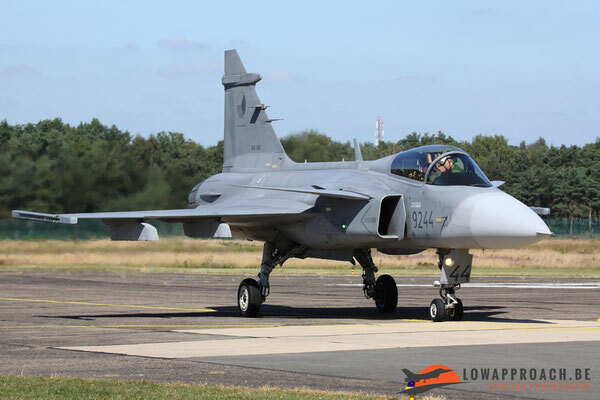 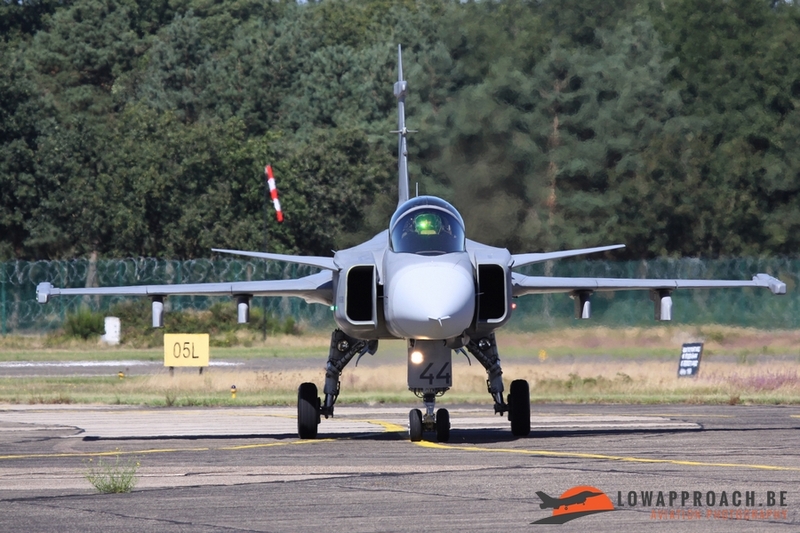 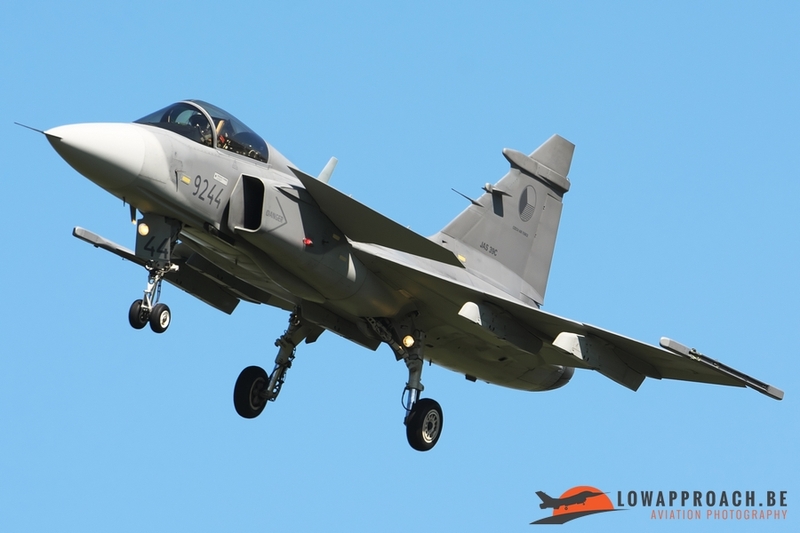 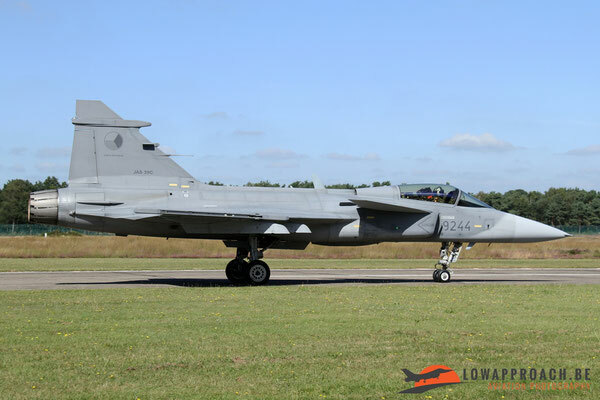 The Czech Air Force came with the latest Saab-product, the JAS39C Gripen. 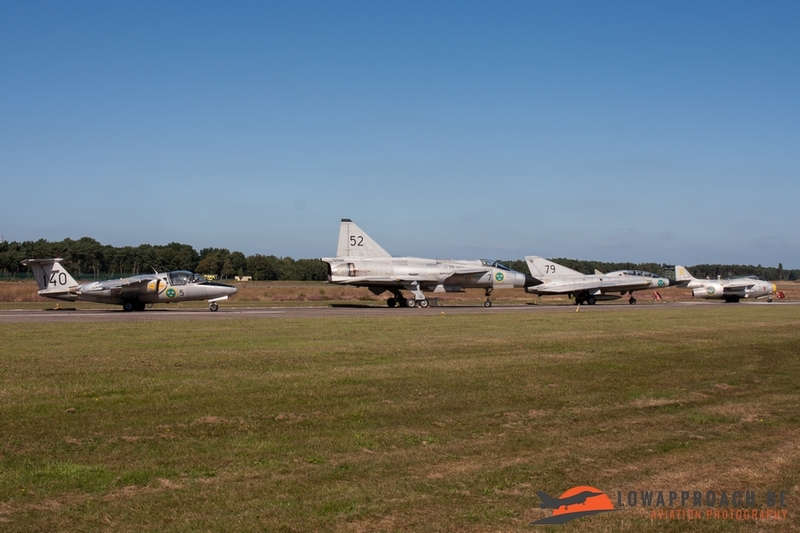 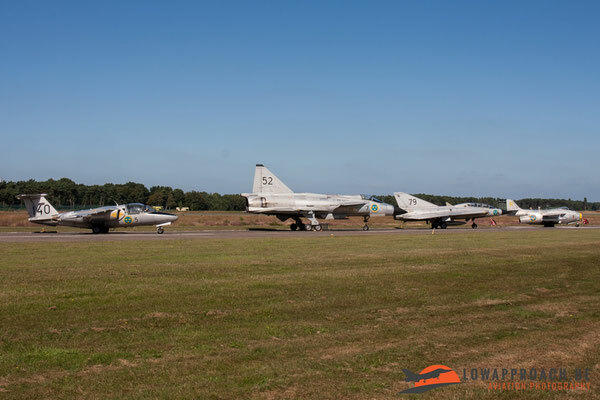 This completed a line-up of four generations of Saab fighter aircraft, but it was a bit of shame that this ‘line-up’ could not be done on the flight line itself…. 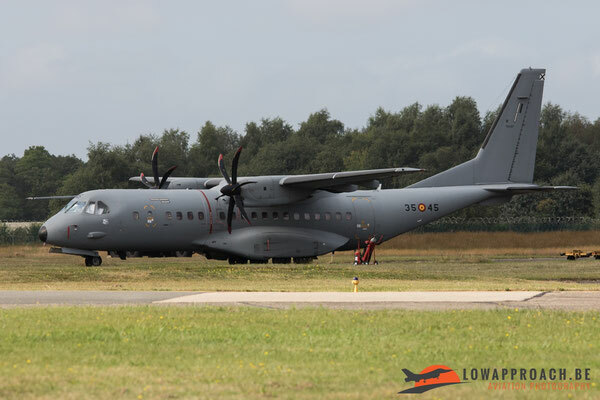 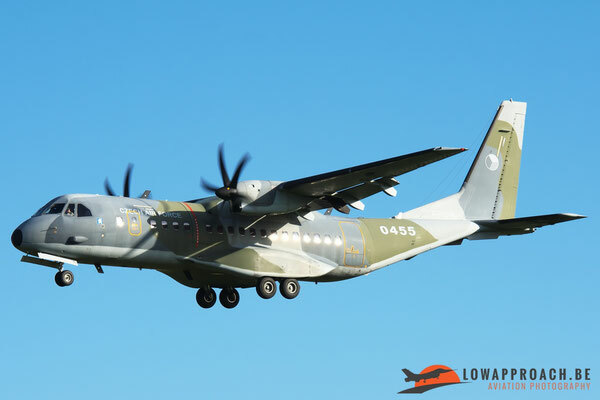 A second Czech aircraft was a Casa C295 who acted as transport for the Gripen support team. 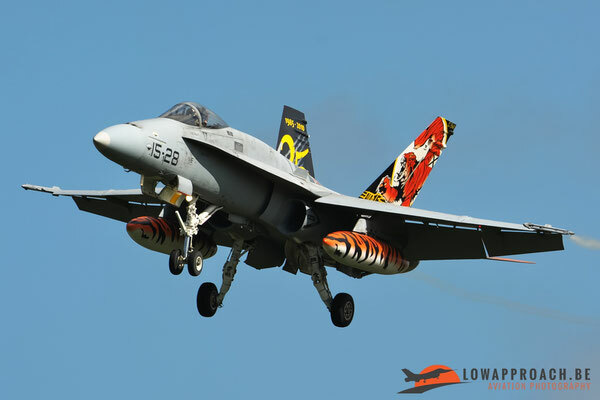 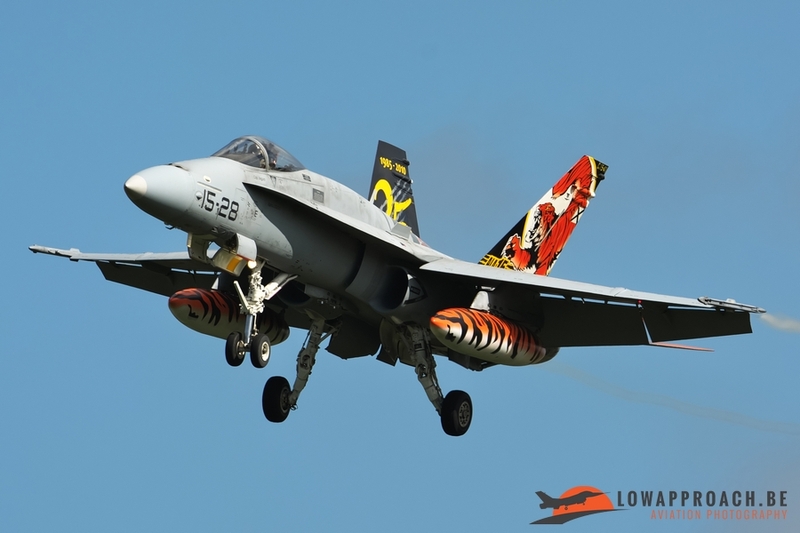 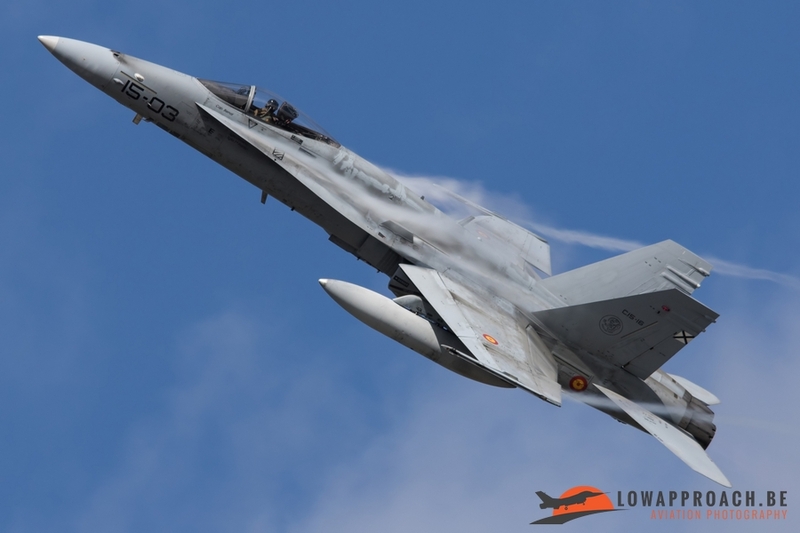 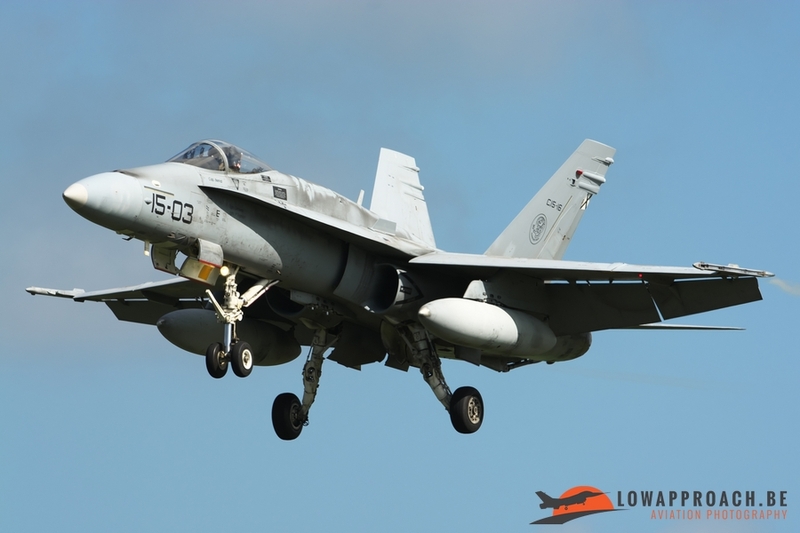 The Spanish Air Force participated with a McDonnell Douglas FA18C Hornet from Ala 15, also a member of NATO Tiger Association. 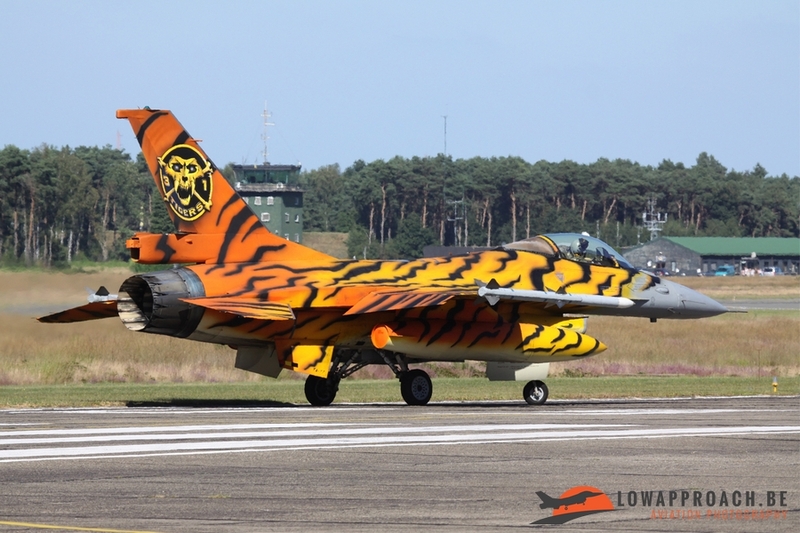 They arrived with their Tiger-bird for year and a back-up aircraft. 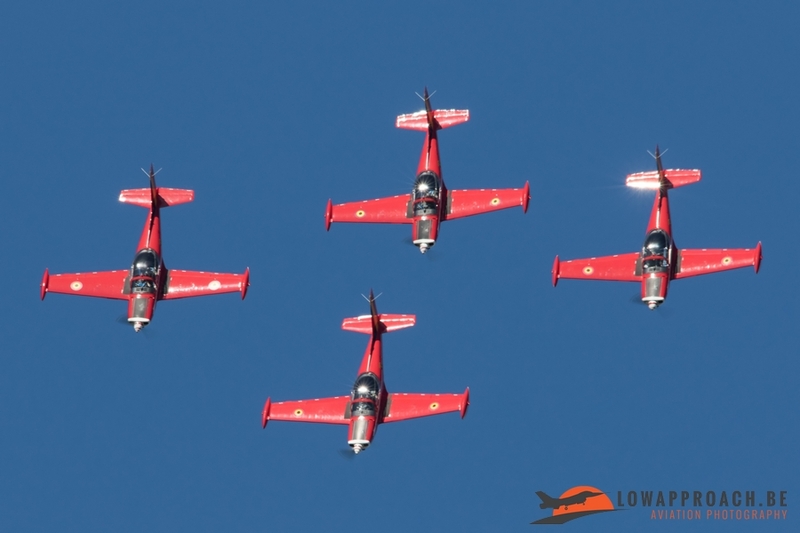 The next European Air Force present at Kleine Brogel was Switzerland. 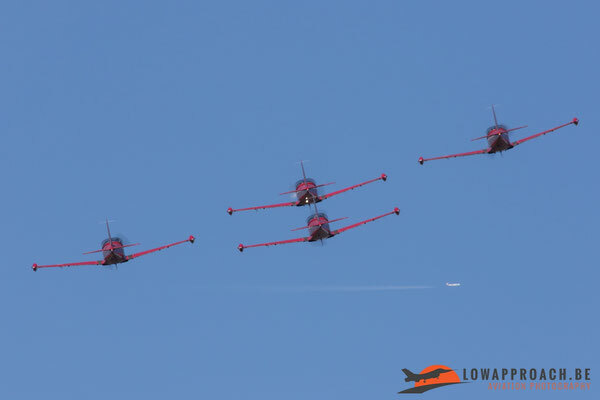 They took part with two teams, the PC7 team and the Cougar helicopter Solo display. 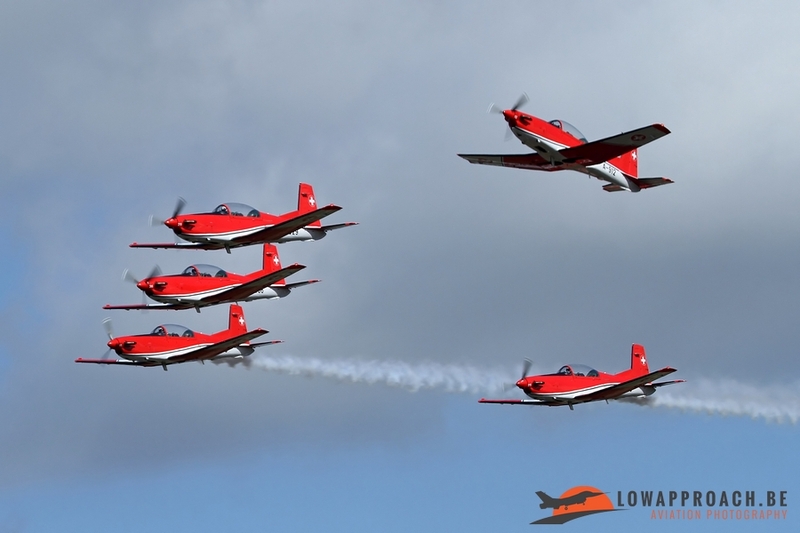 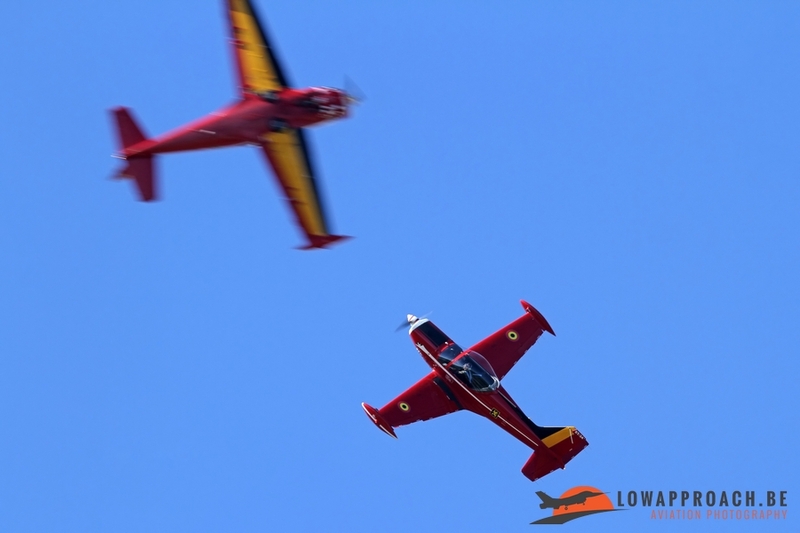 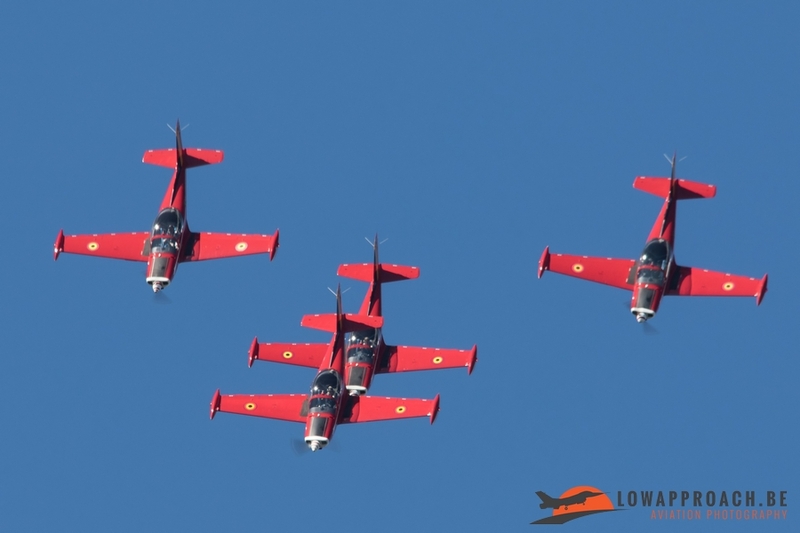 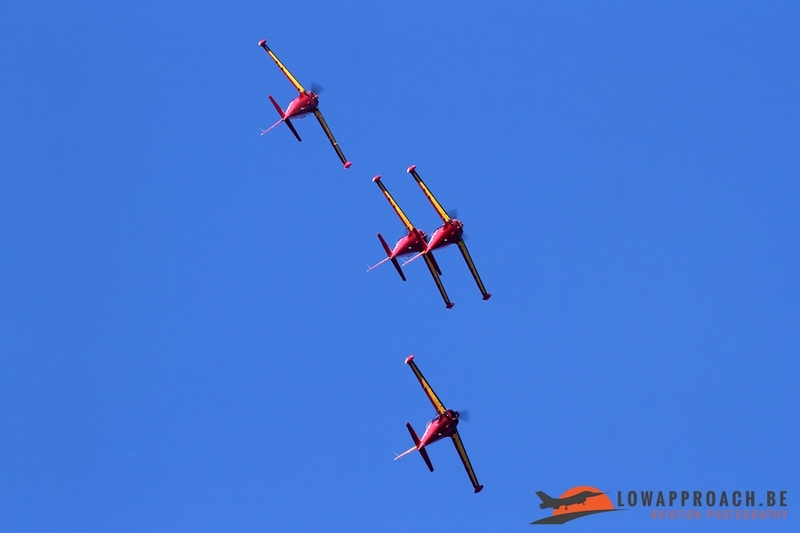 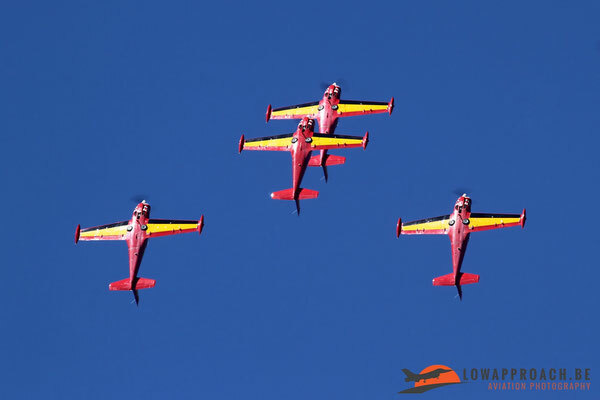 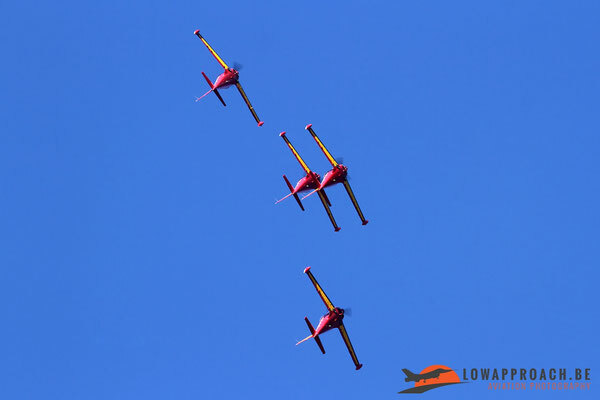 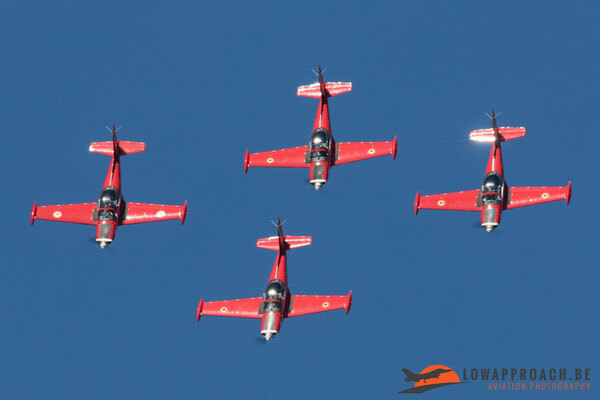 The PC7-team is composed of 9 Pilatus PC7 advanced trainers, flown by Air Force pilots from various frontline units, normally flying the F18 Hornet. 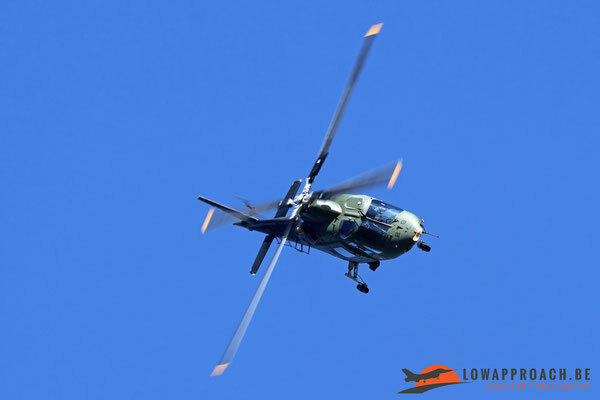 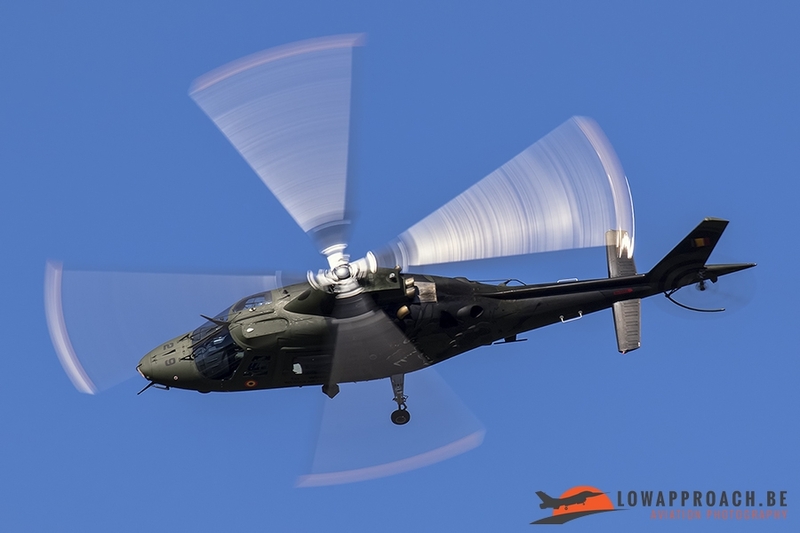 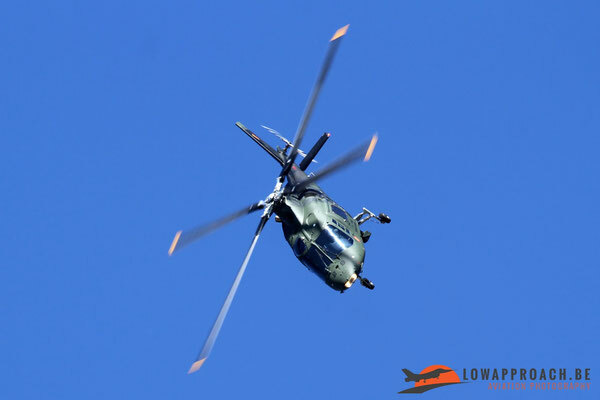 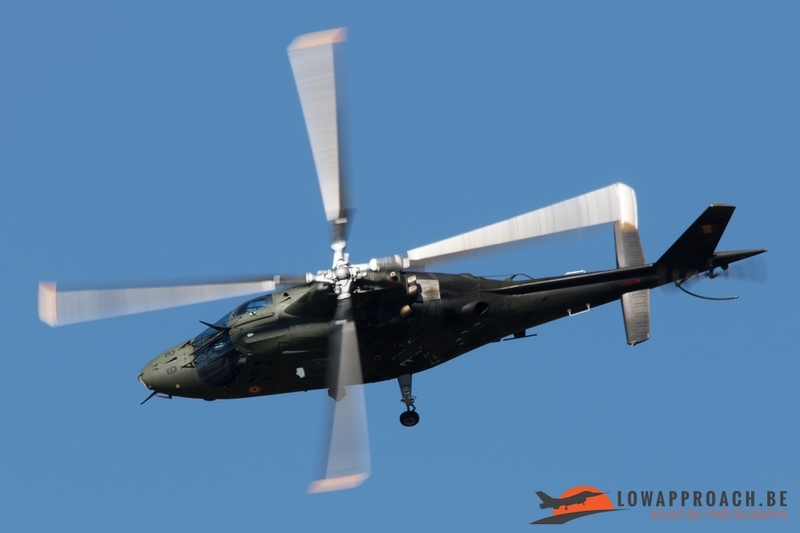 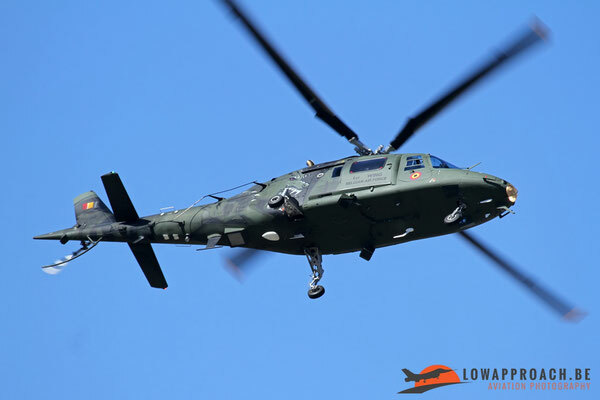 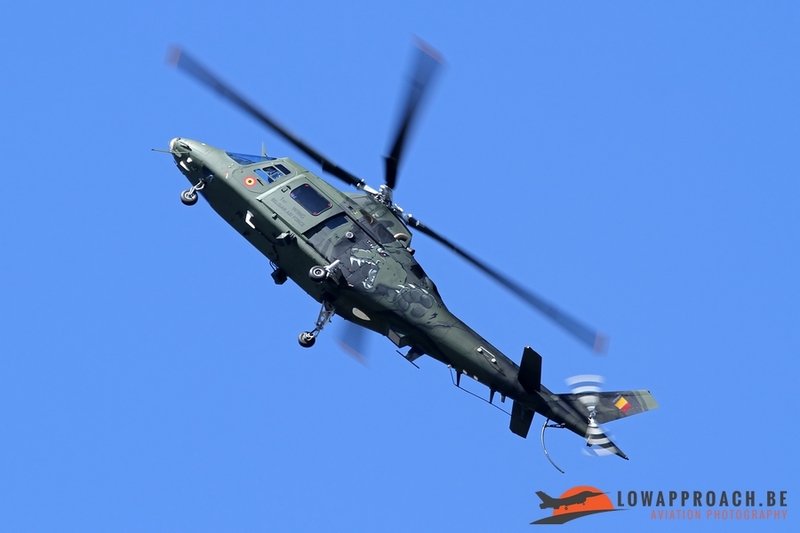 Unfortunately they didn’t perform their full display at Kleine Brogel, so only a few landing shots…. 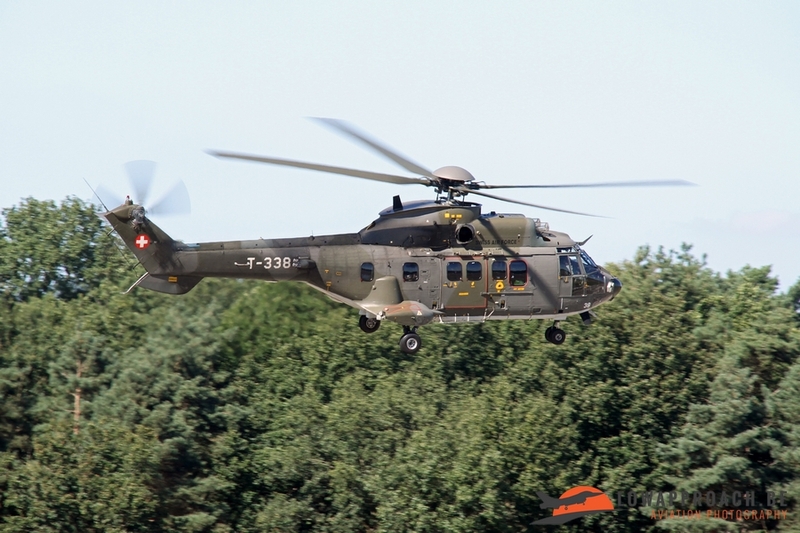 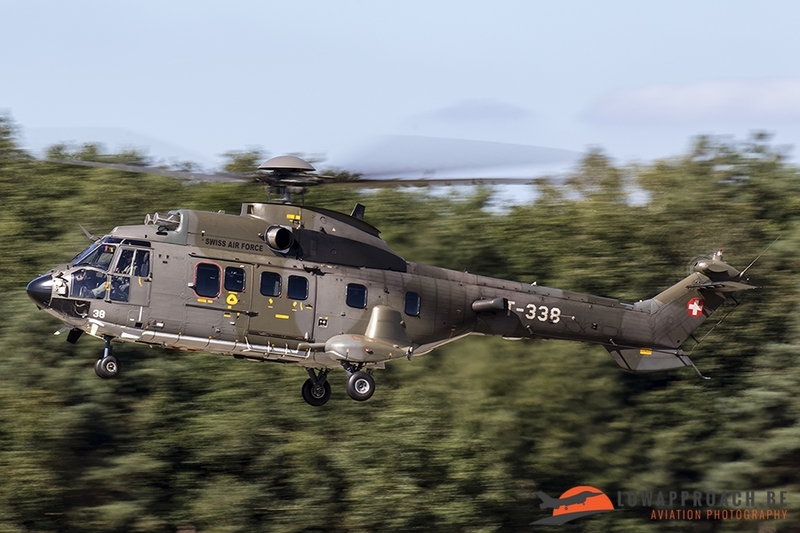 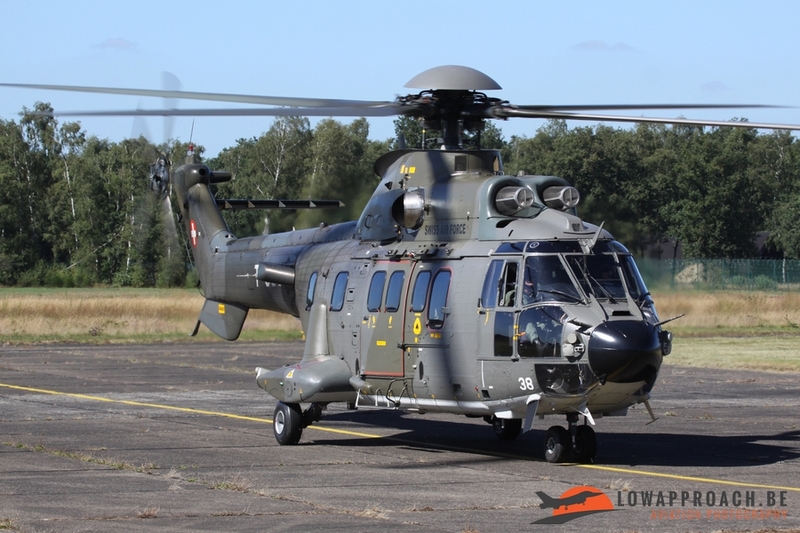 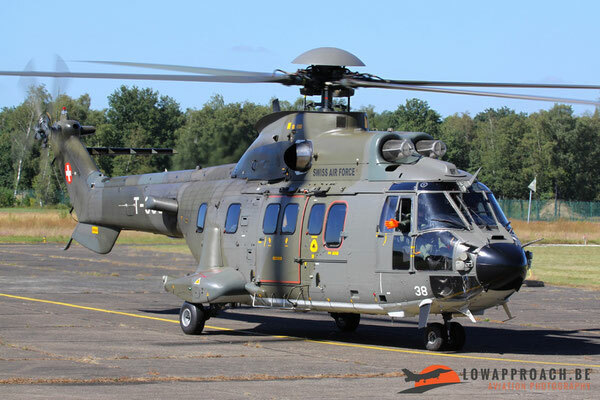 The Eurocopter AS532UL Cougar is the largest helicopter in the Swiss inventory. It’s used as a heavy transport in the Swiss mountains. 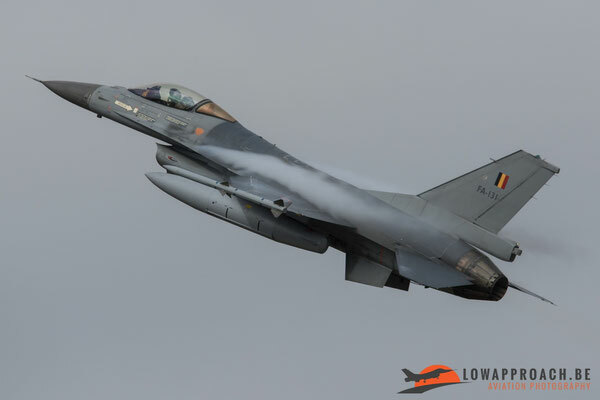 At Kleine Brogel it only landed for a few minutes and then left again for Sanicole for a rehearsel, and display later in the evening. 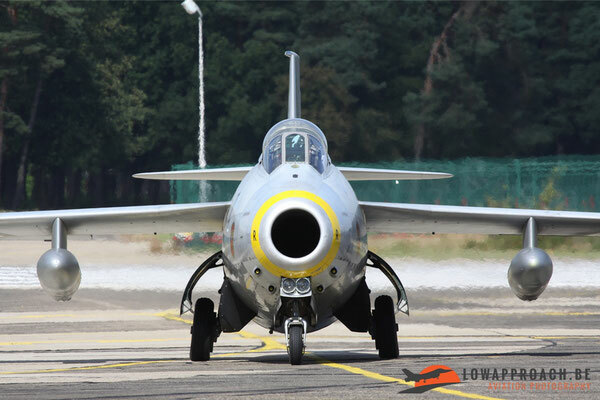 A few weeks after Kleine Brogel/Sanicole we received the news that this particular example, T-338, was lost in a fatal accident in the Swiss Alps in which two crewmembers lost their lives…. 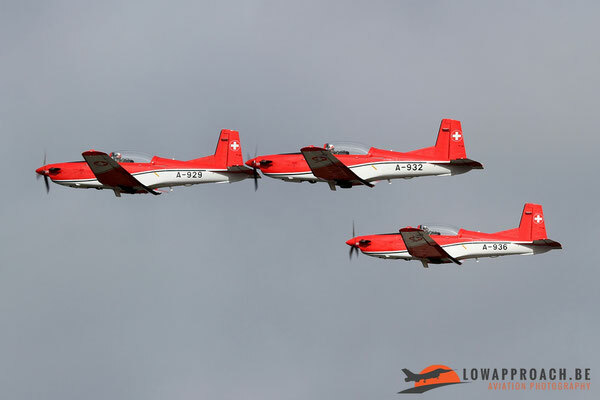 A small tribute from the Low Approach team, who enjoyed so much hospitality from the Swiss earlier this year. 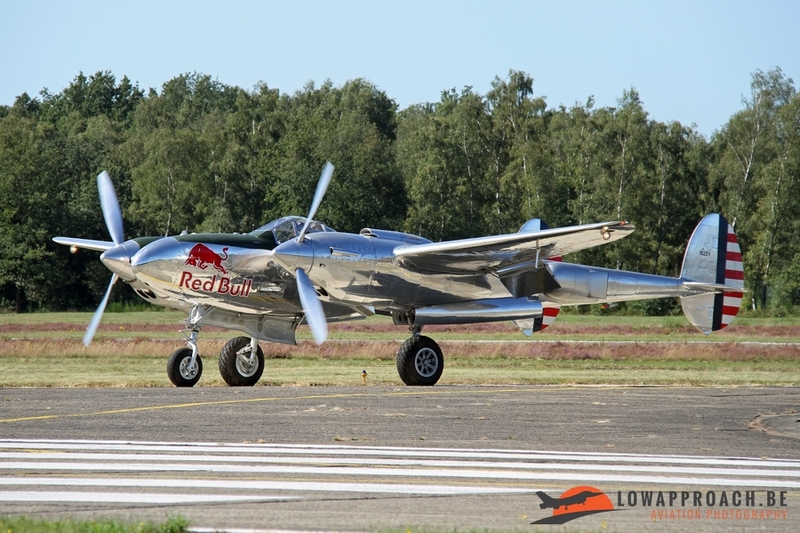 As always the Sanicole Airshow has a number of interesting warbirds on the program. Two of these flying beauties came from the Flying Bulls collection based at Salzburg in Austria. 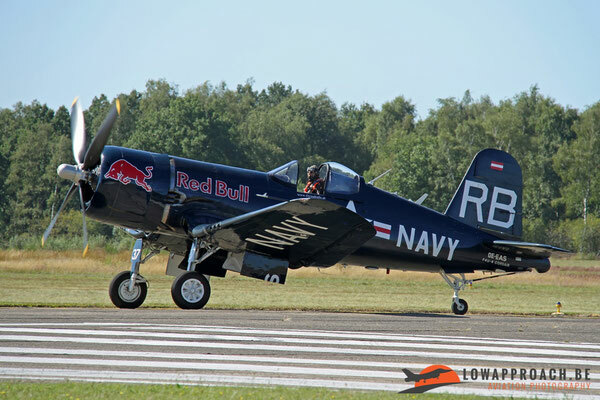 This organization, sponsored by Red Bull, provided two rare aircraft. 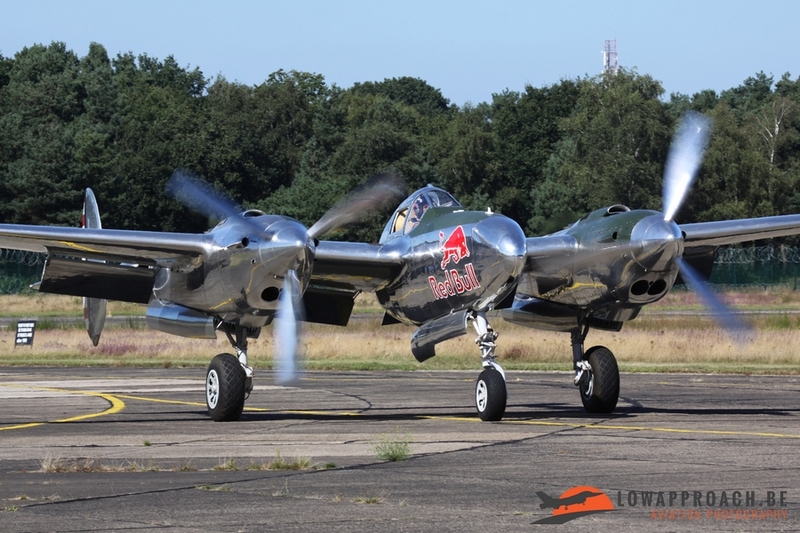 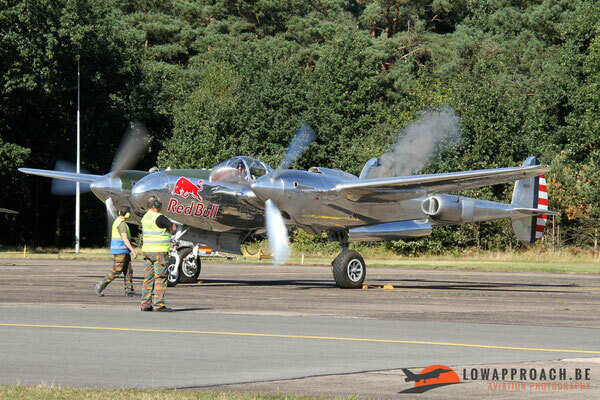 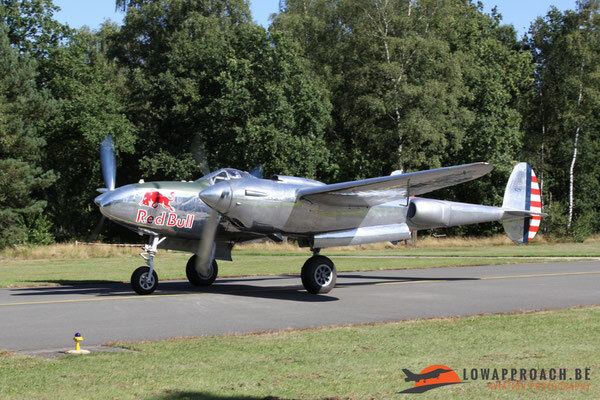 The first to arrive was the Lockheed P38 Lightning. 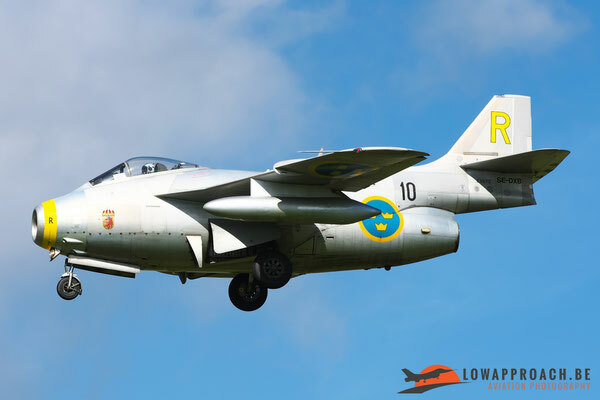 This twin-engined aircraft was developed during the second World War and was used in various roles, having its most succes in the Pacific theatre. Secondly they came with the Vought F4U Corsair. 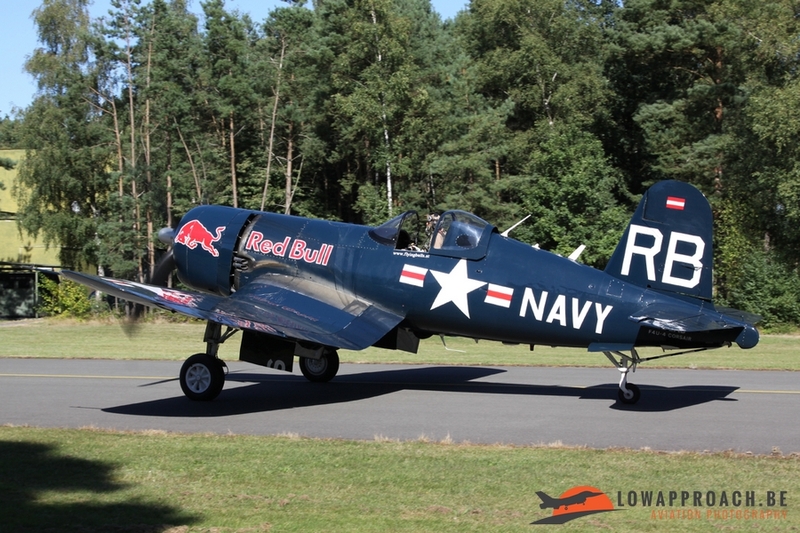 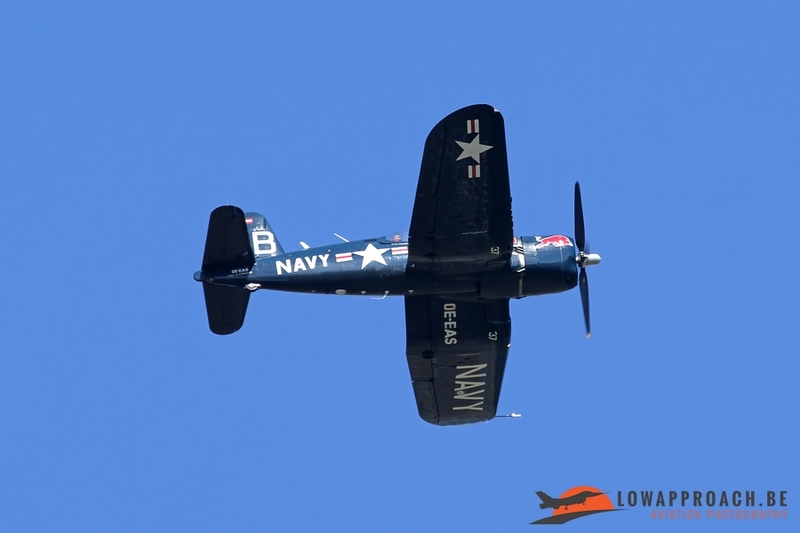 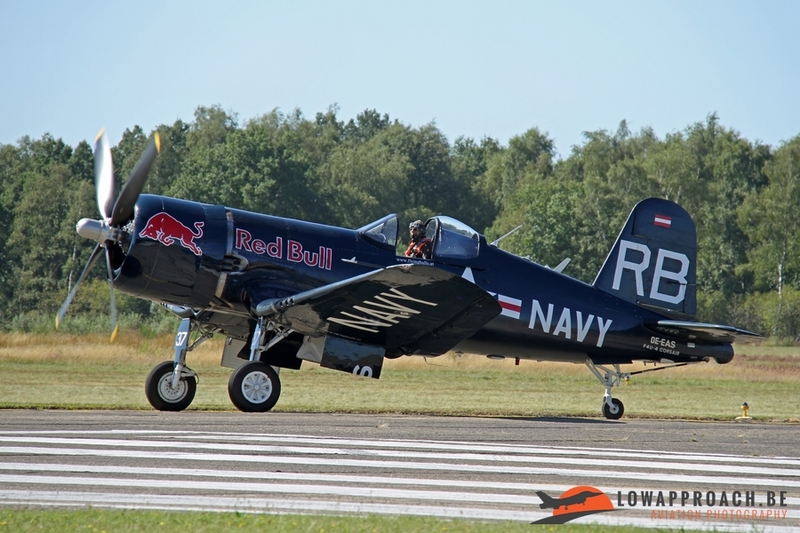 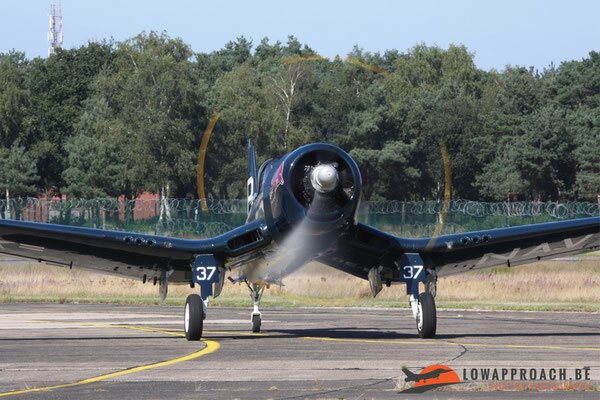 The Corsair was build for operations on the US Navy carriers in the Pacific. It can be recognized by its characteristic bent wings, who also have a folding mechanism to save storage area on the carriers. 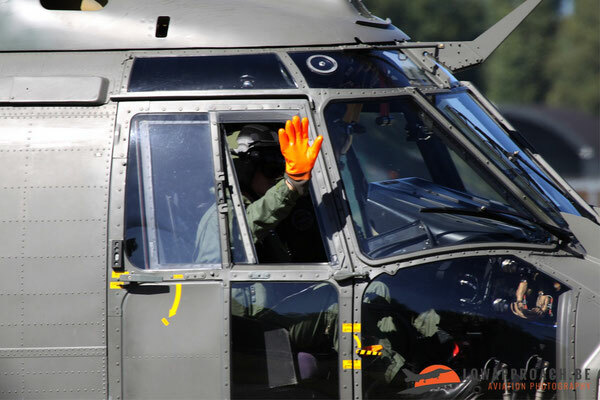 This feature was nicely demonstrated when the aircraft took off for a training flight over Sanicole. 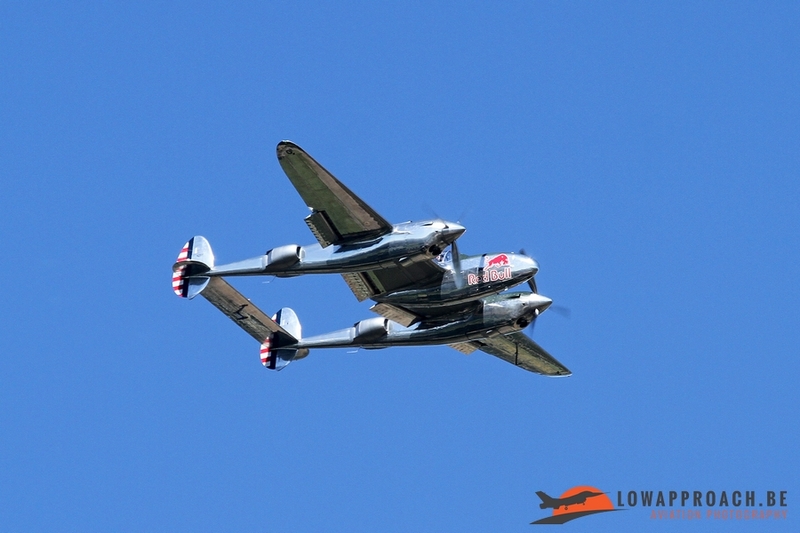 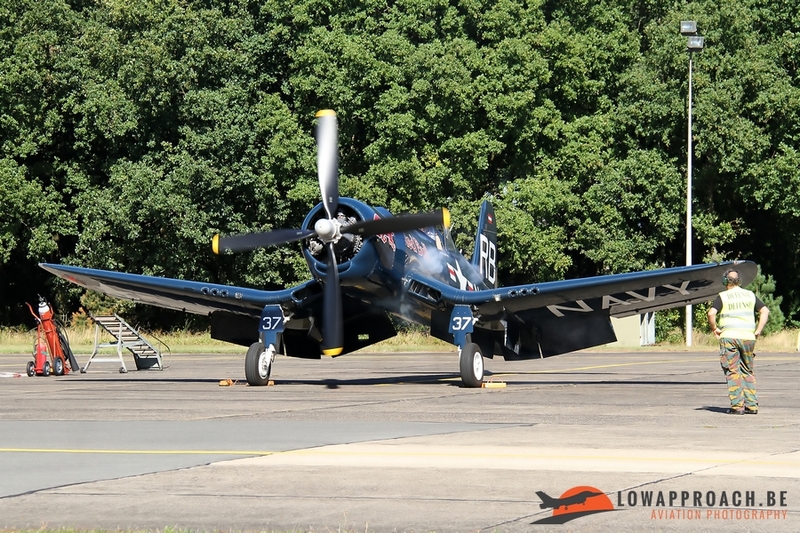 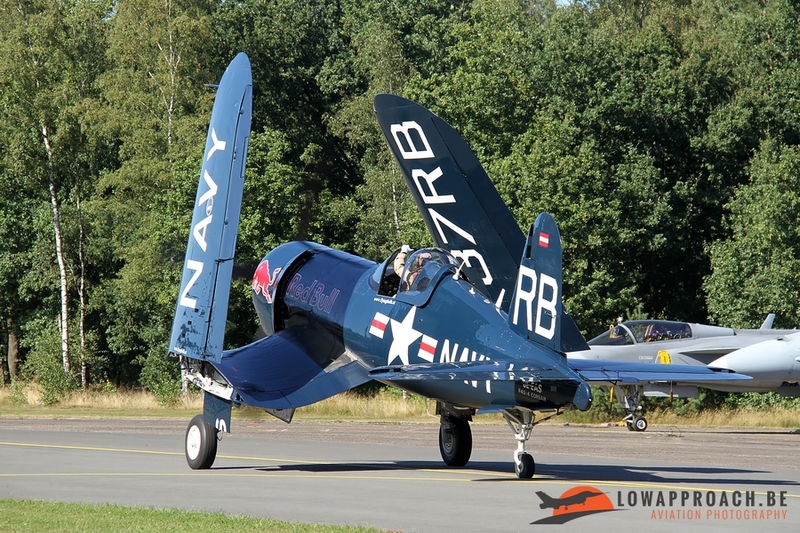 Final ‘warbird’ that we saw at Kleine Brogel has a bit of special history. 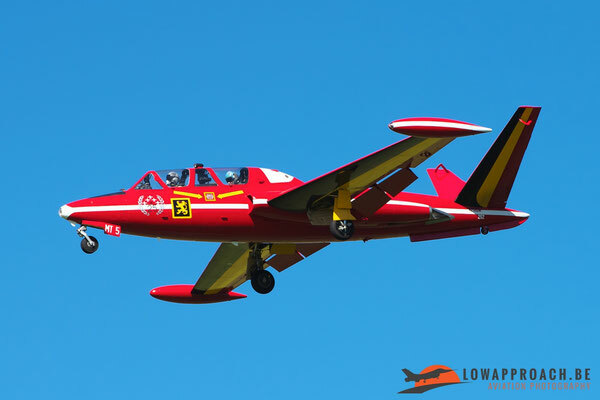 In the early sixties the Belgian Air Force acquired a number of Fouga CM170 Magister for use as an advanced trainer. 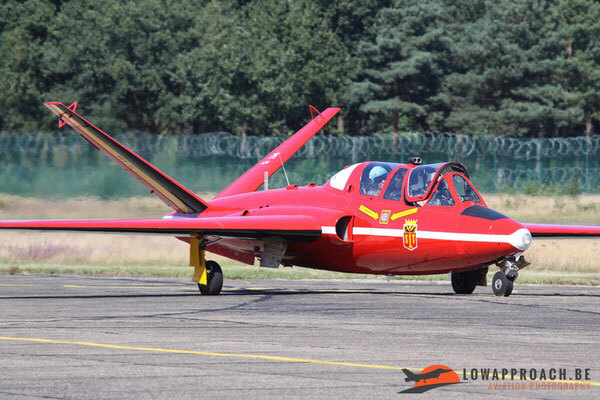 The Magister became quite famous for its use by the Red Devils demonstration team in the sixties and seventies. 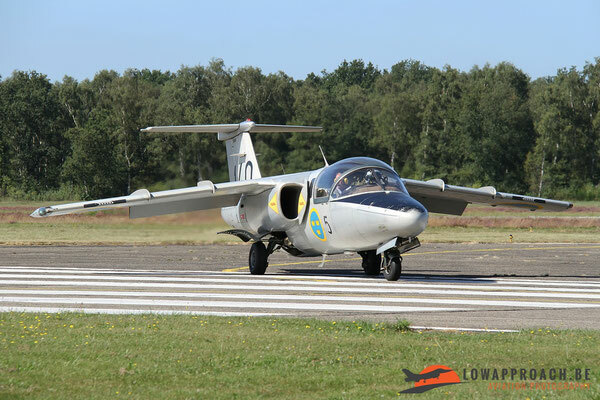 In the late seventies the aircraft was replaced by the Alpha Jet and a number of Belgian aircraft were put up for disposal. 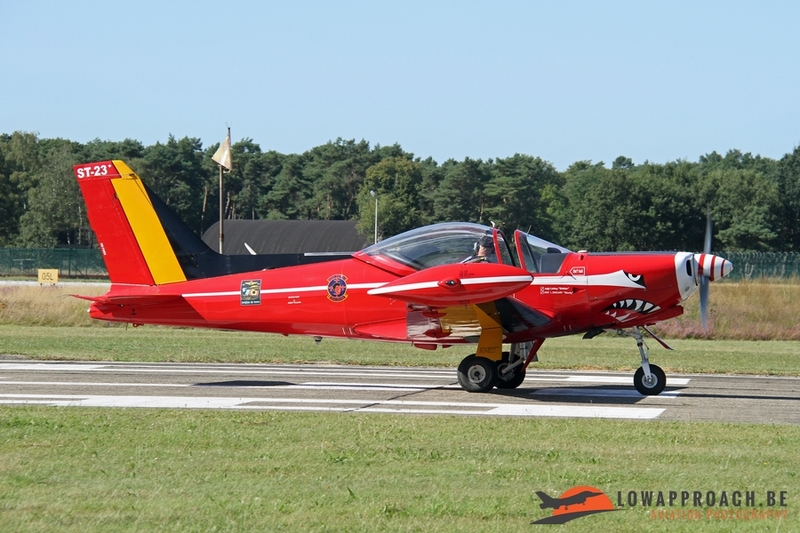 A number of these were bought by the Israeli Air Force who intended to convert them to the IAI Tzukit, the Israel variant of the Magister. These plans failed so the aircraft were sold again and ended up in the warbird circuit in the United States. Fouga MT-5 was carefully restored by its new American owner and repainted in the Red Devils colorscheme. 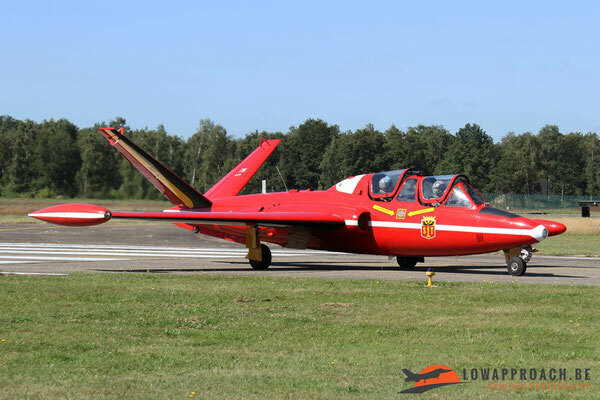 After a couple of years the owner decided to donate the aircraft to the Stampe Museum in Antwerp, who arranged for the transport back to Belgium and overhaul. 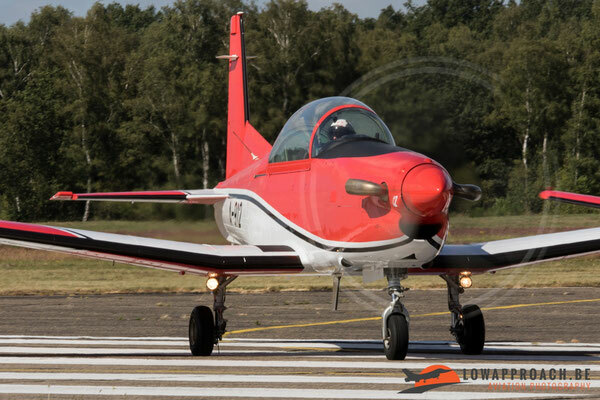 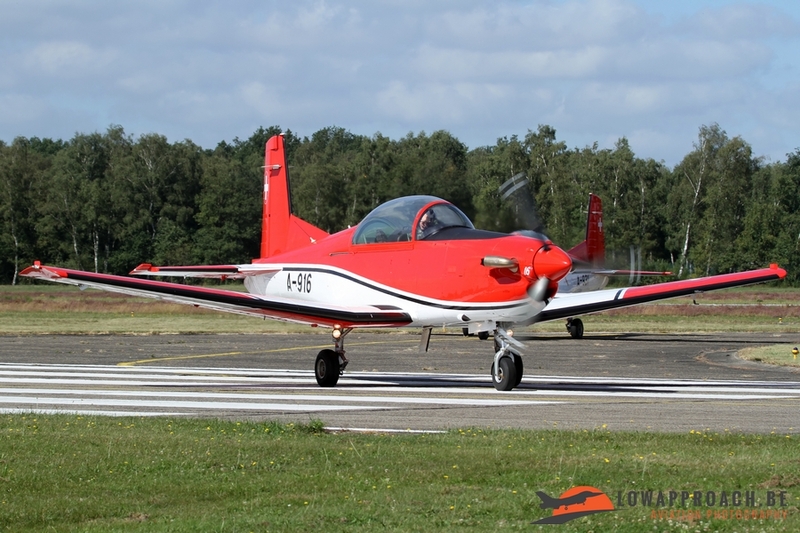 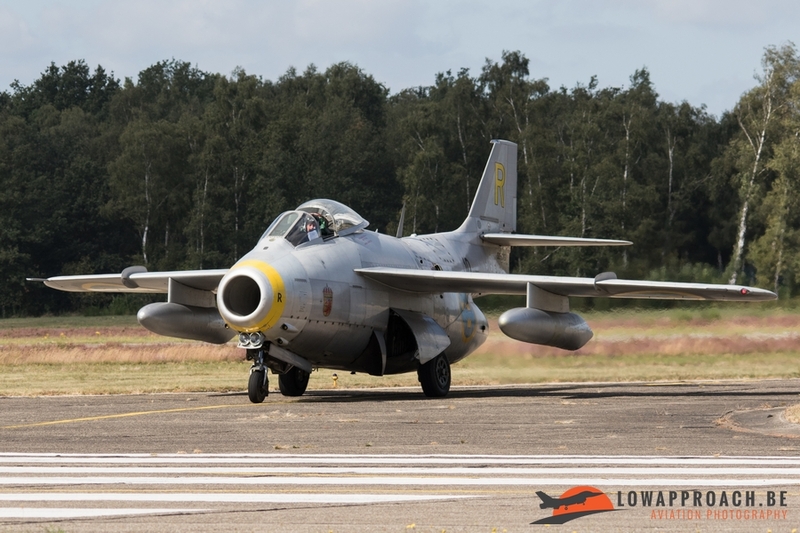 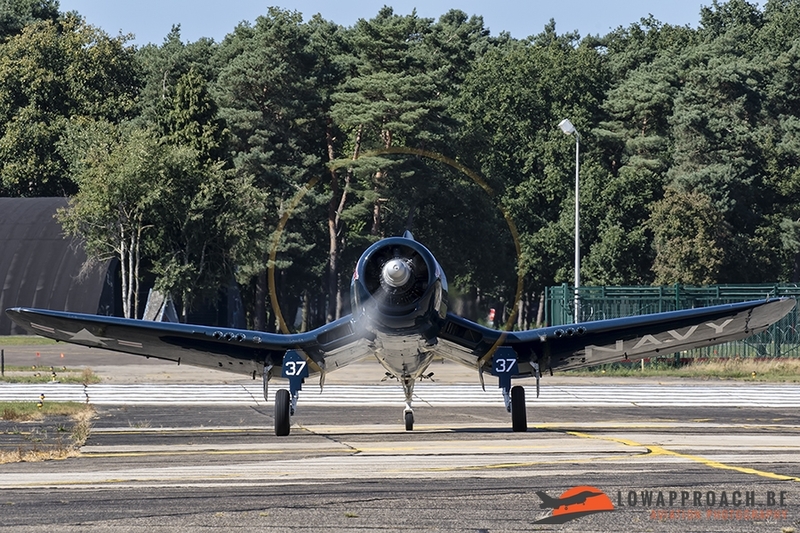 Earlier this year MT-5 participated in its first airshow at Florennes and now it was at Kleine Brogel, a wonderful story regarding a wonderful aircraft and I really hope that we enjoy MT-5 for many years to come. 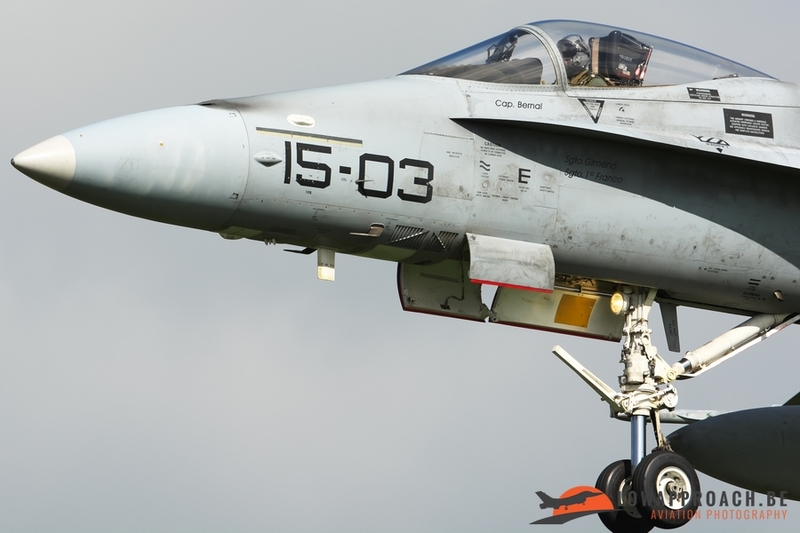 The last aircraft in this article is a bit of an exception. 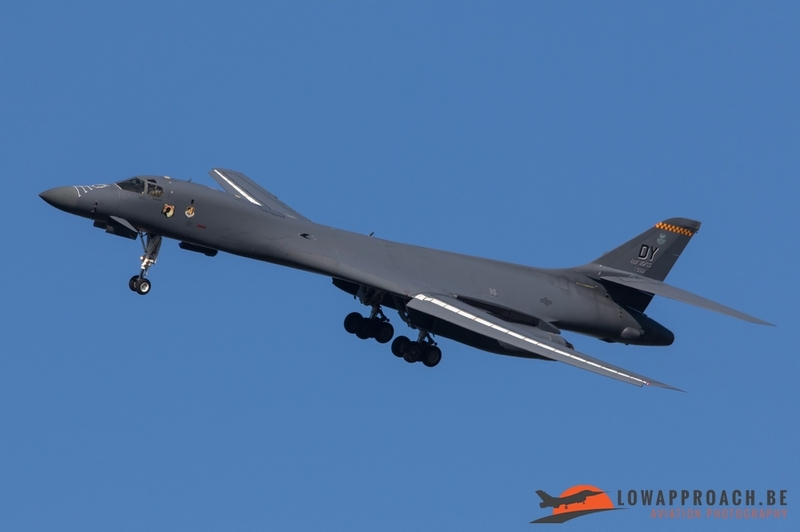 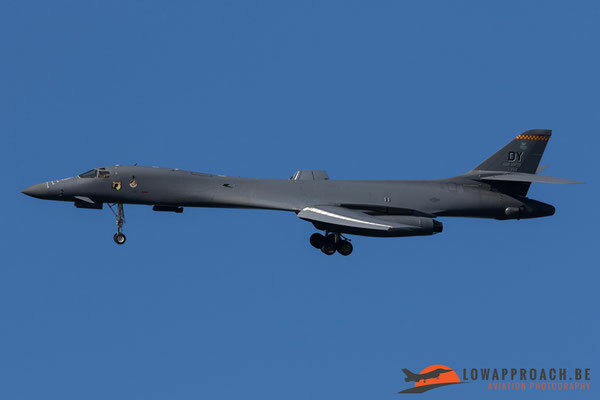 The largest announced aircraft for this years Sanicole Sunset show on Friday evening was a Rockwell B1B Lancer from the US Air Force. The aircraft was about one hour ahead of schedule over Sanicole, so many in and around Kleine Brogel could see this aircraft in a holding pattern. Low Approach-member Dirk was the luckiest of us all, as he managed to make some nice shots from this aircraft in the approach to Kleine Brogel…. from the back of his garden. 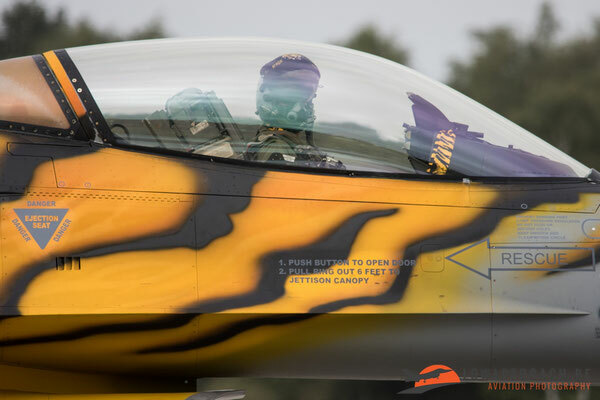 This Open Door was a really nice event. It was a good opportunity to get to know the people and equipment at Kleine Brogel a bit better, and hopefully they succeeded in their goal, creating more understanding for their being there from the local inhabitants. 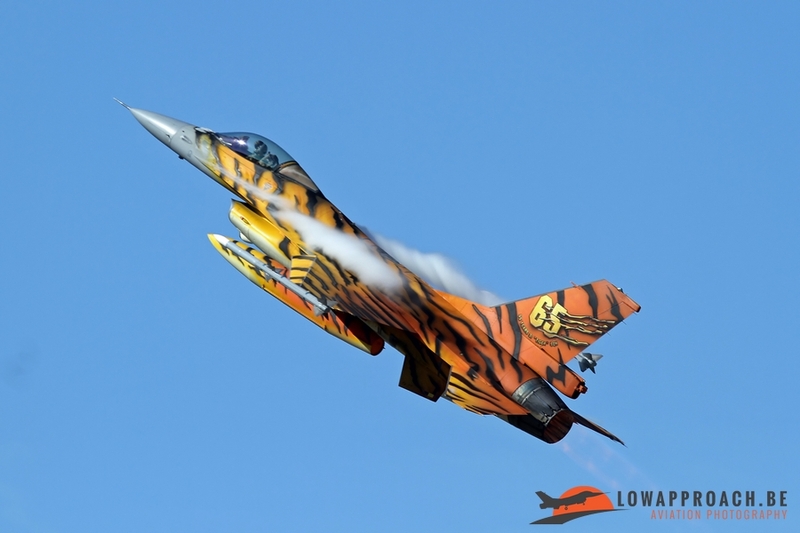 Hopefully this type of event can be organized in future years as well.